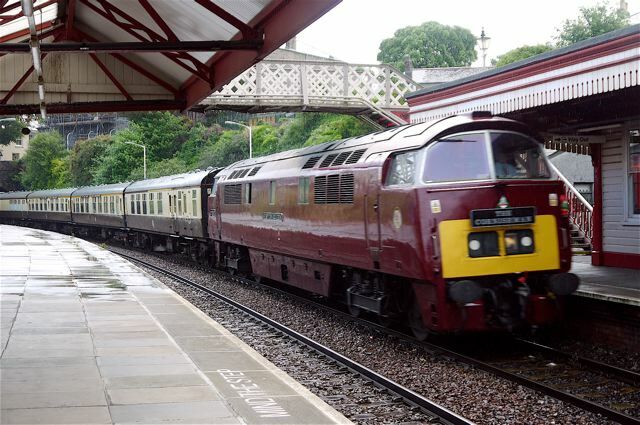 Headboards. 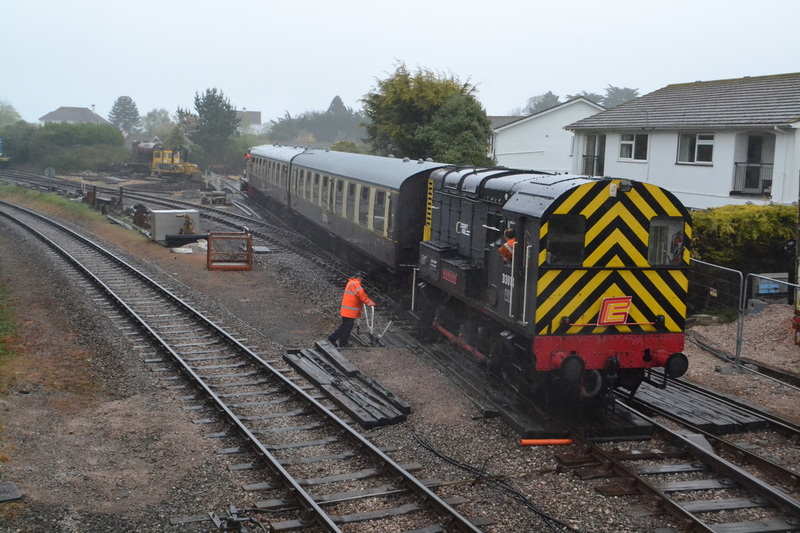 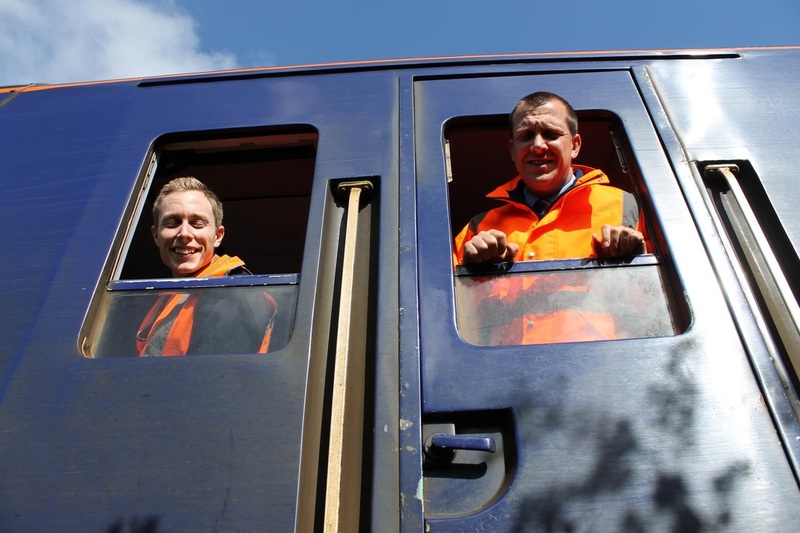 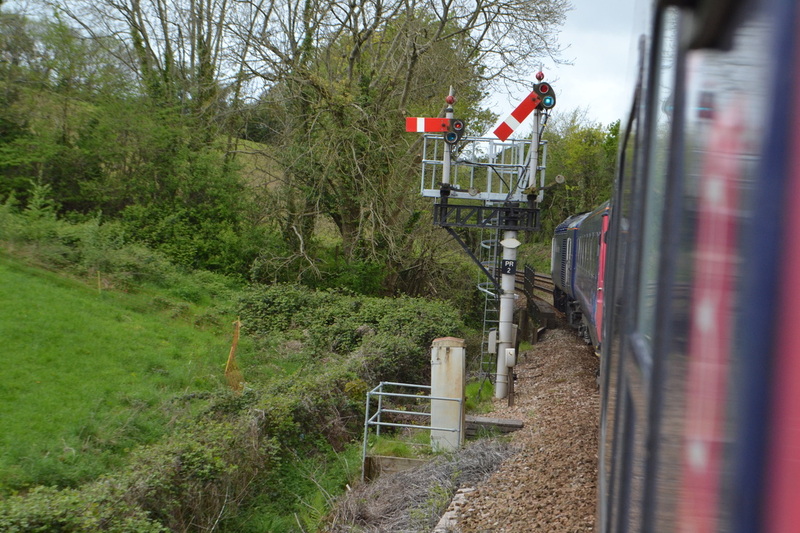 FGW were not happy to have headboards in place whilst the train was on the mainline, and 'in motion'. 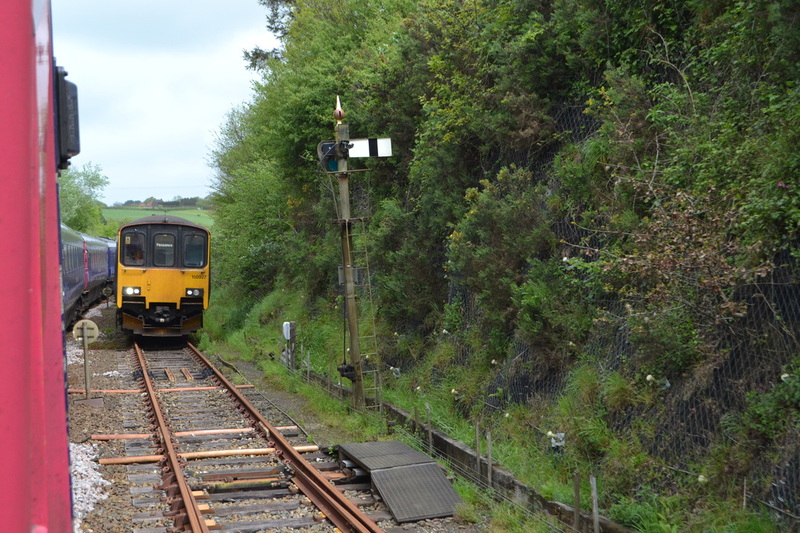 Some times we did leave them in place for short sections into sidings though. 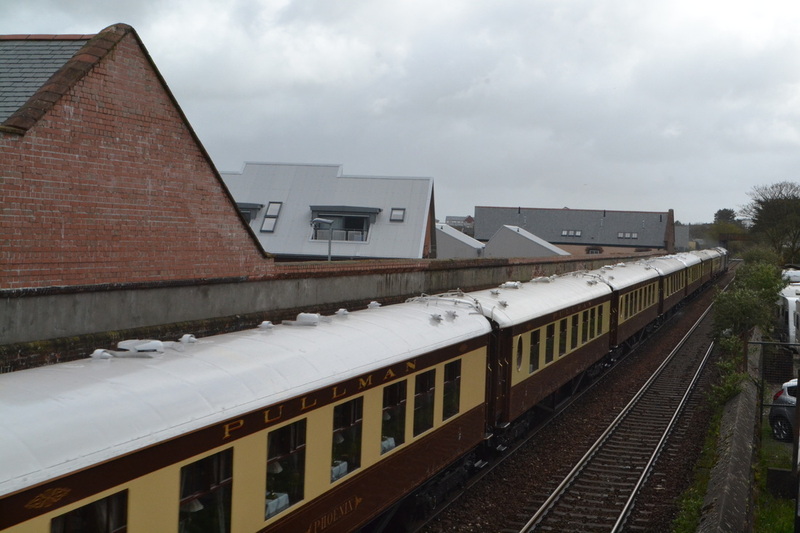 It is the L&C I headboard which was carried at the opposite end to the BLS one. 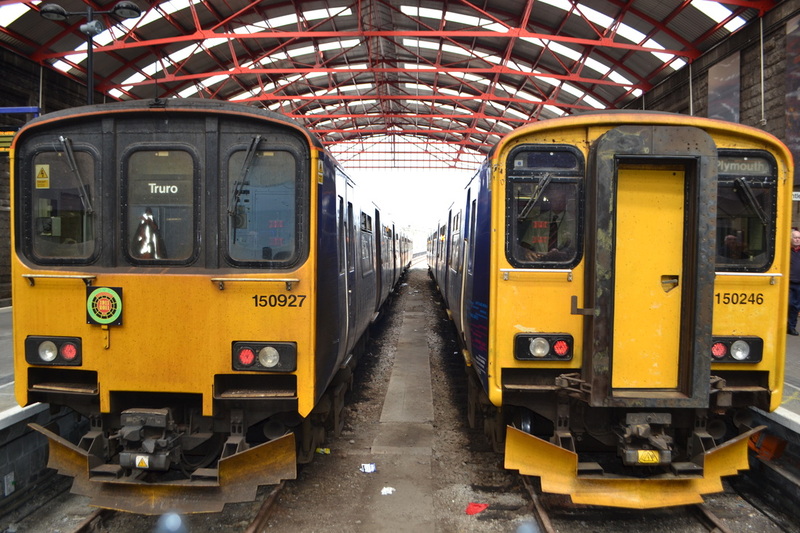 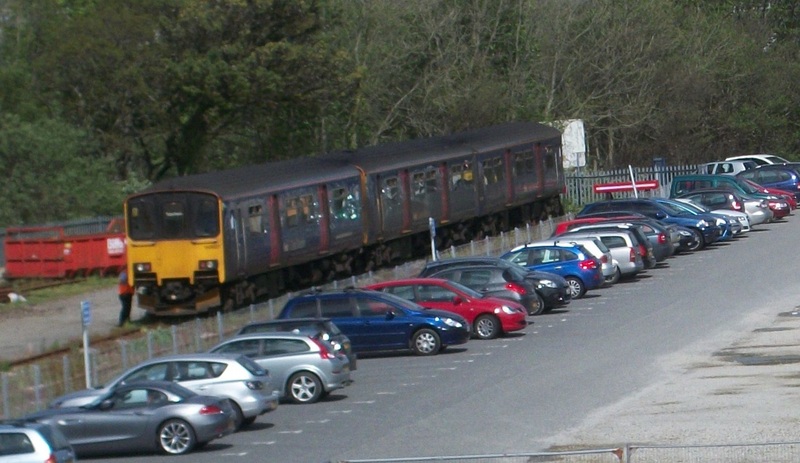 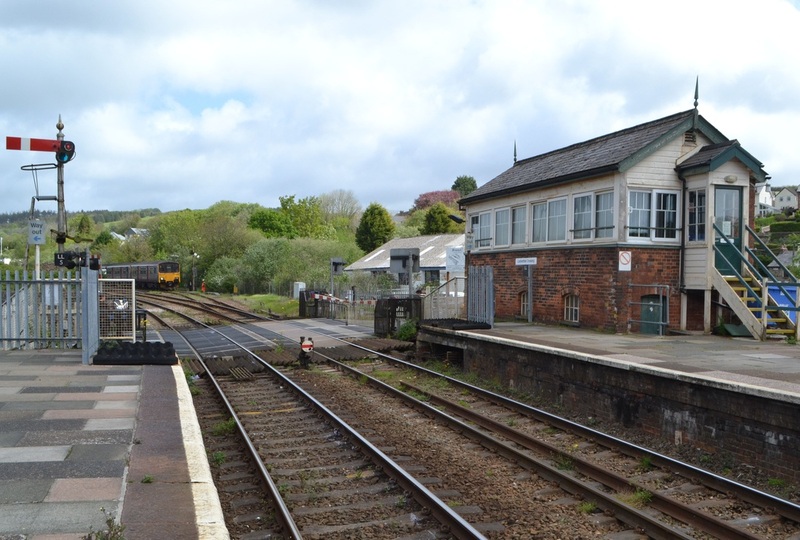 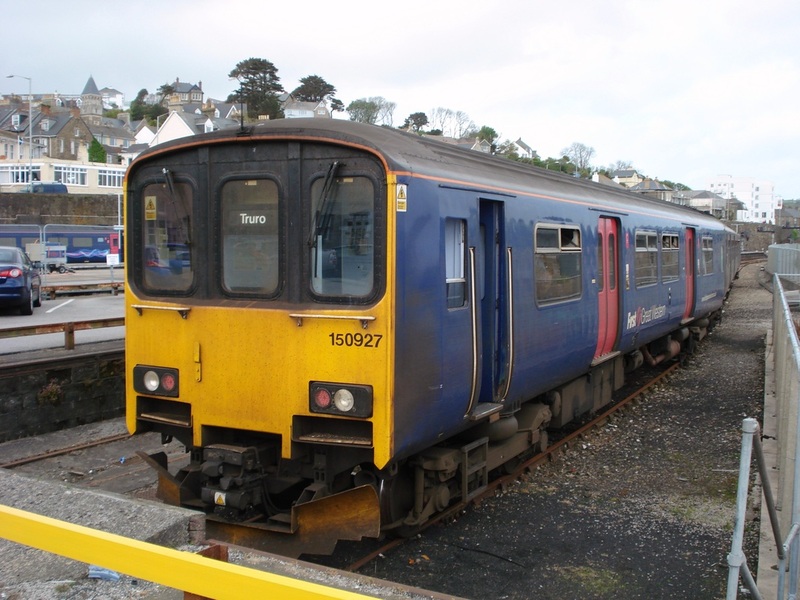 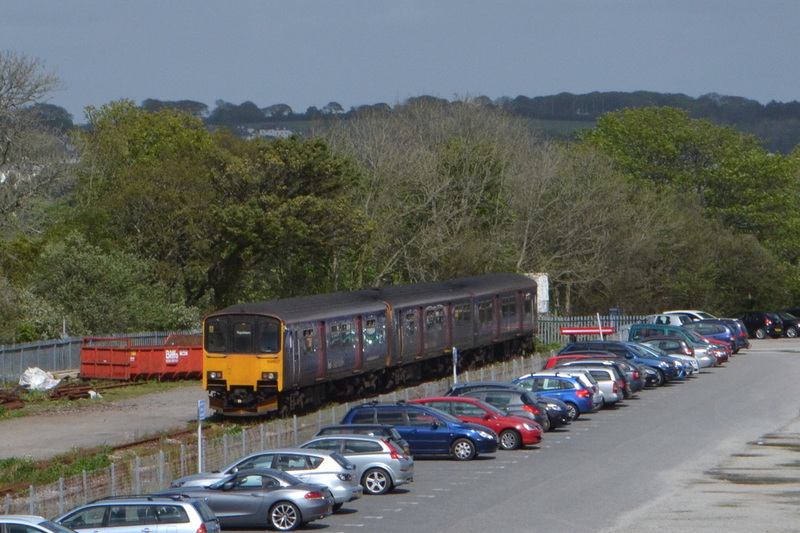 Lostwithiel Yard. 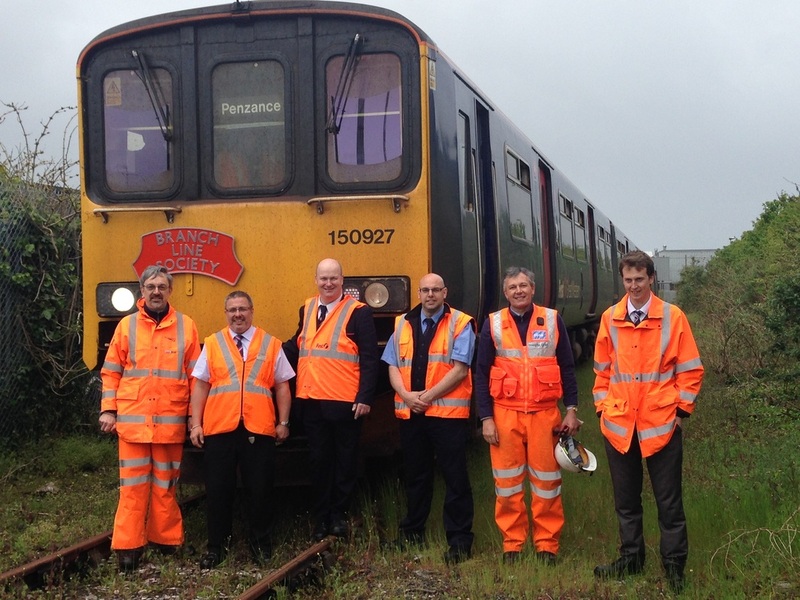 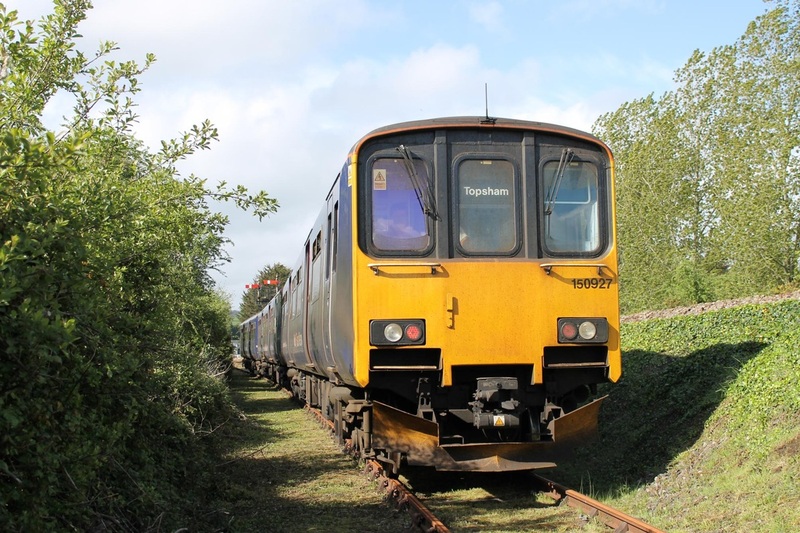 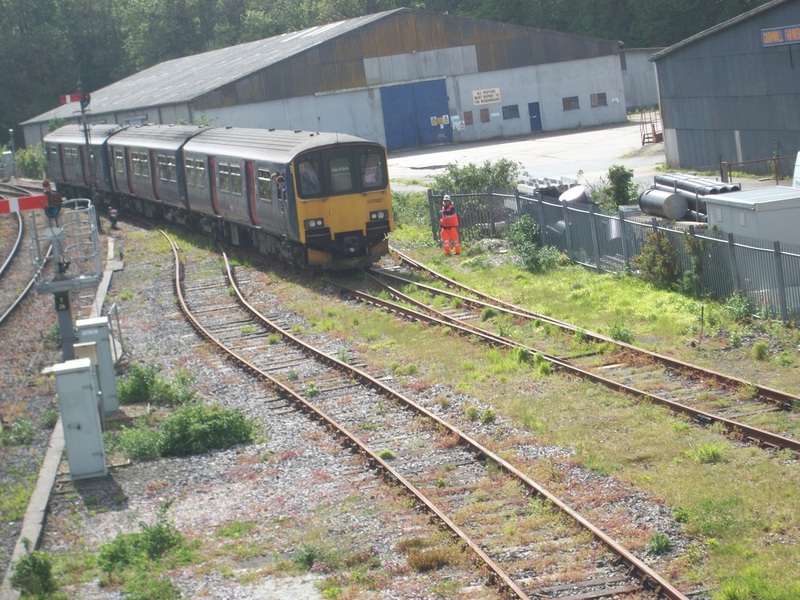 An approach was made to Network Rail at the planning stage of the tour to traverse the disused yard, but we were told it is owned by DB Schenker. 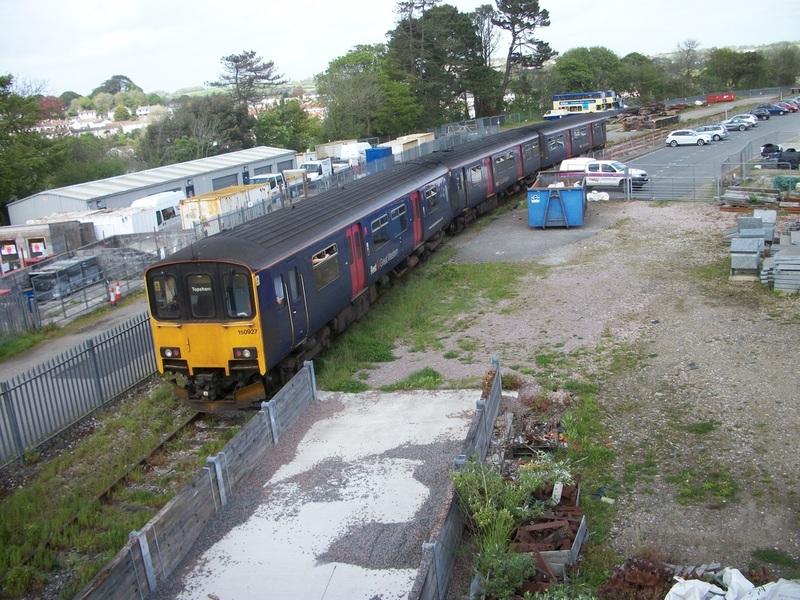 Upon contacting them, they quoted a figure in excessive of £1000 - and this just to get the track inspected for our possible use, let alone any work that May have needed to be undertaken. 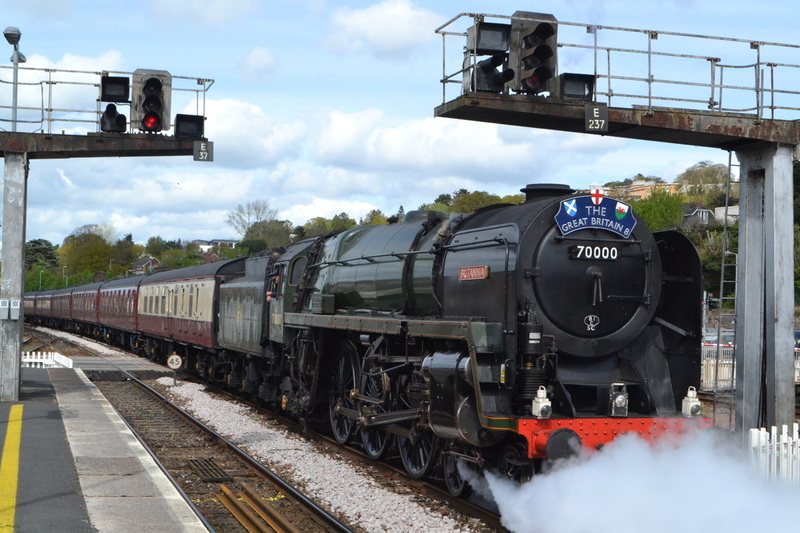 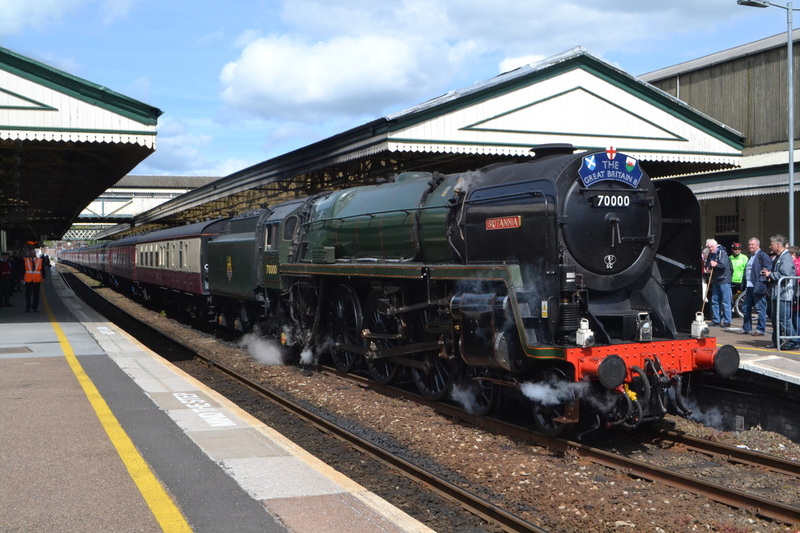 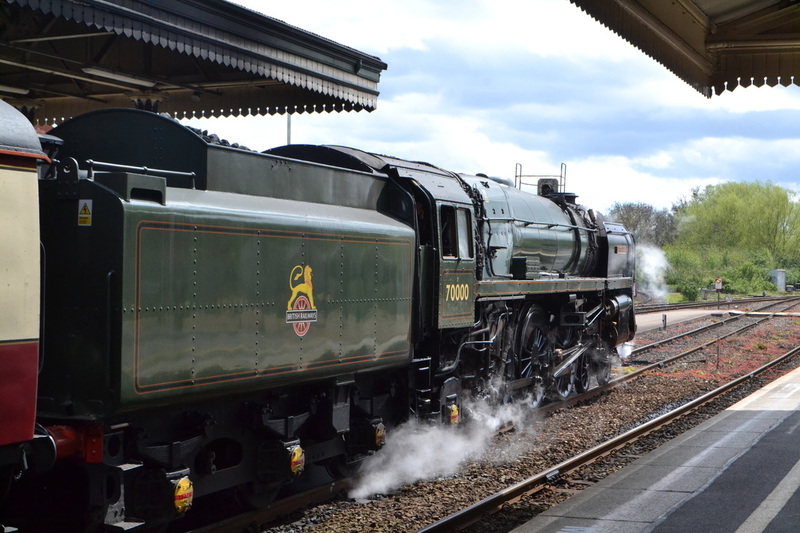 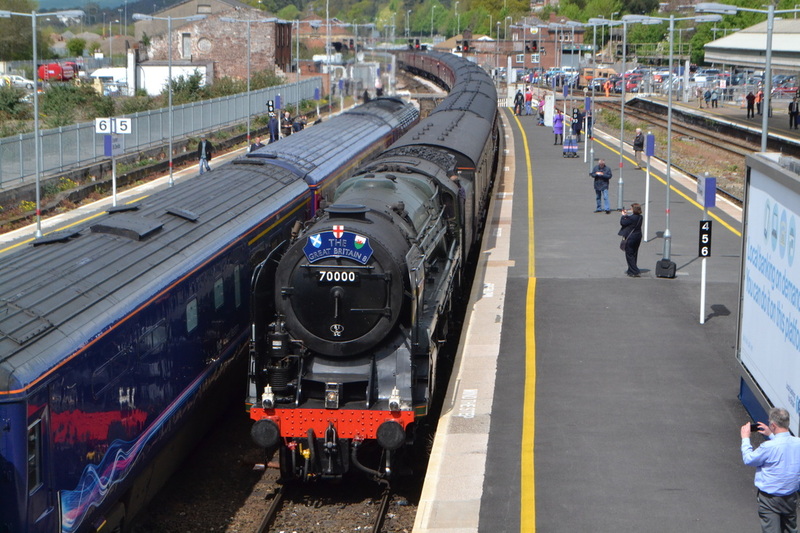 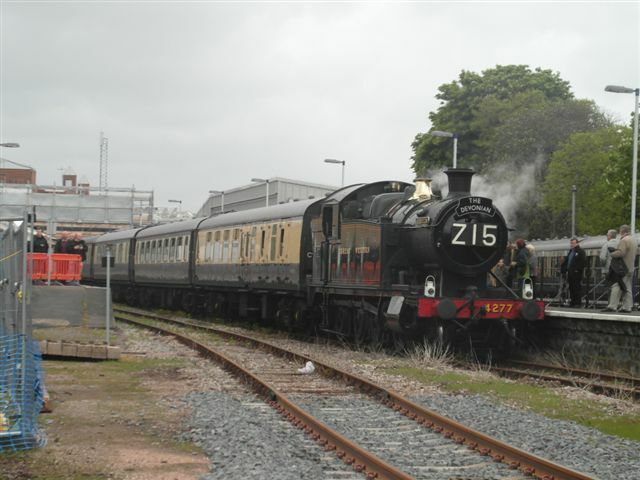 Britannia at Exeter St Davids. 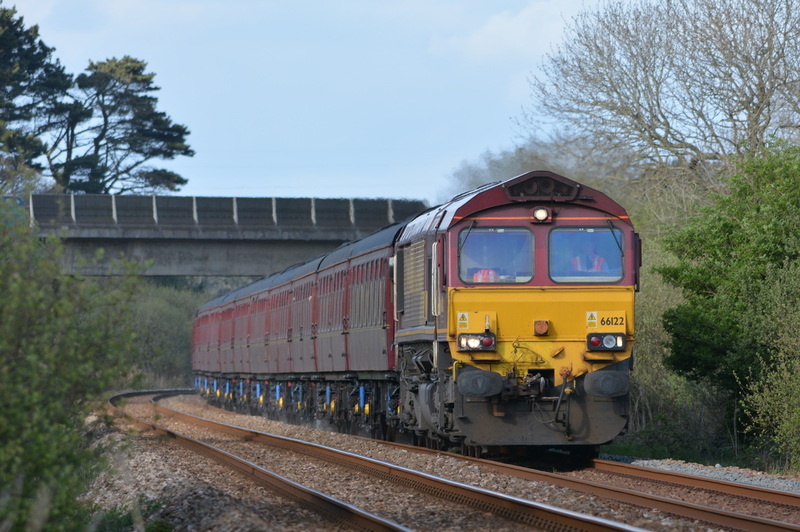 28th April 2015 Copyright Roger Winnen. 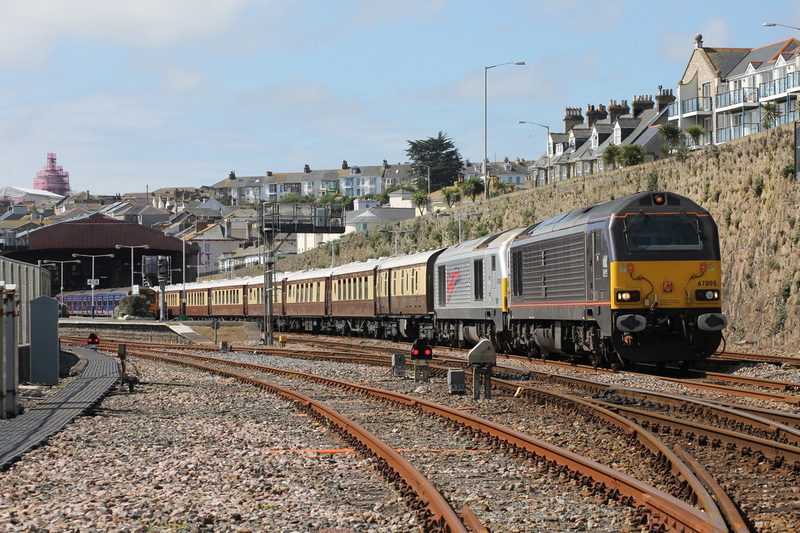 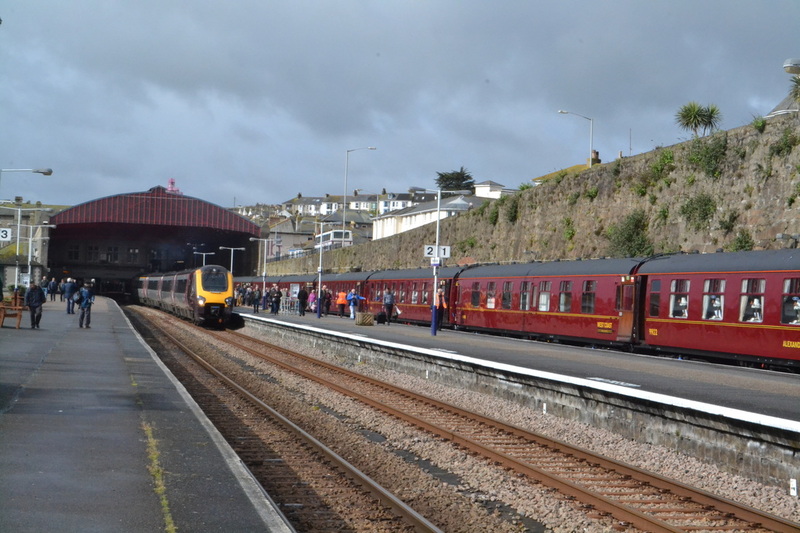 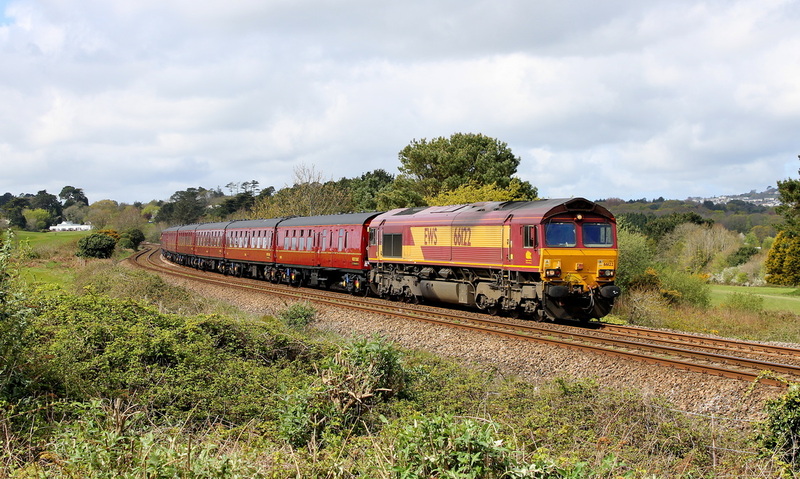 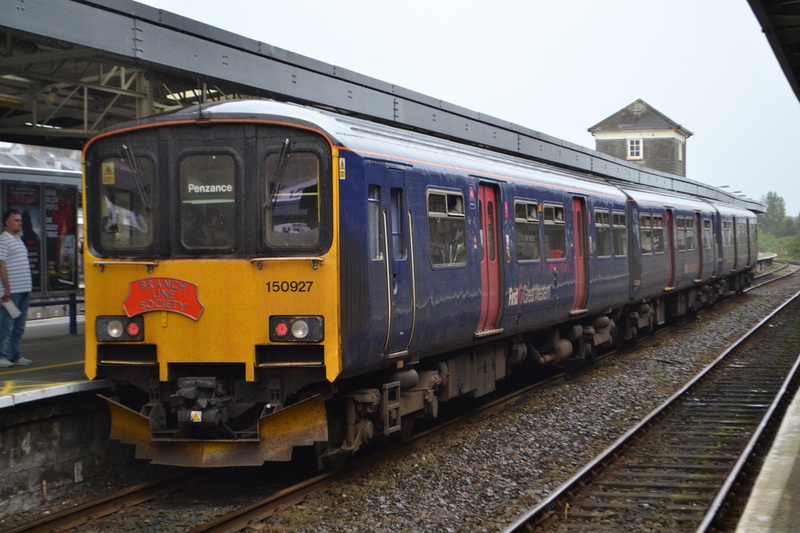 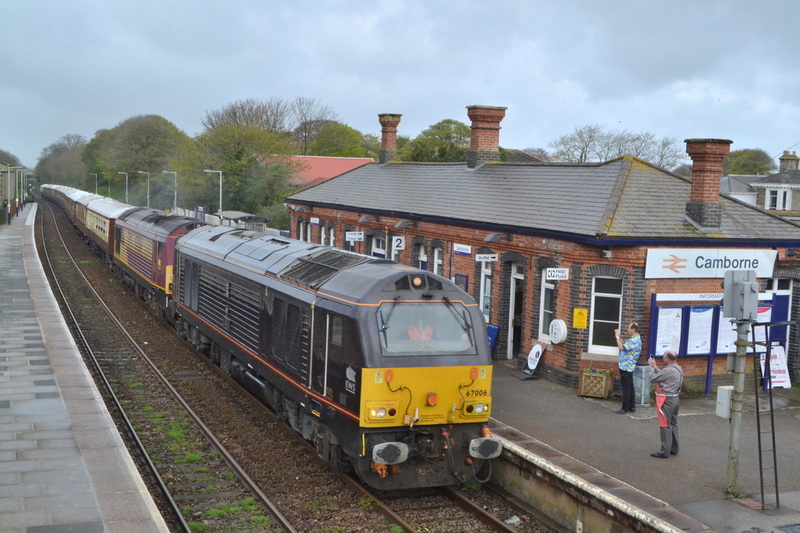 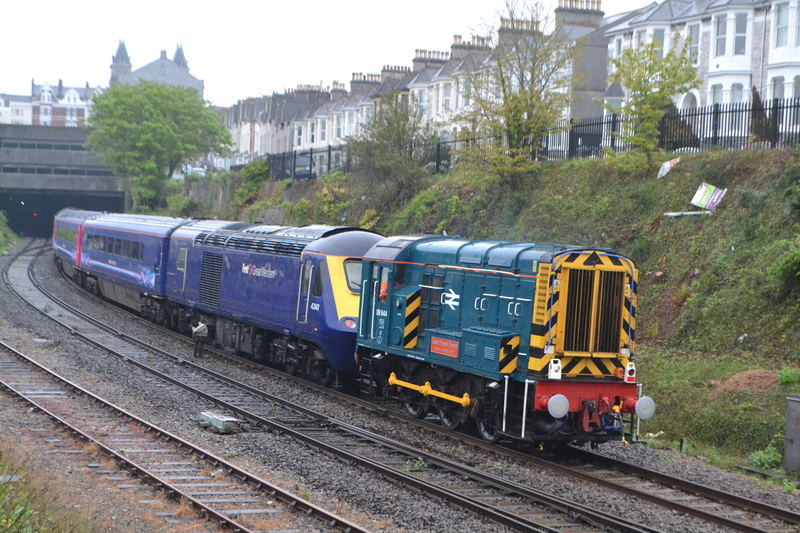 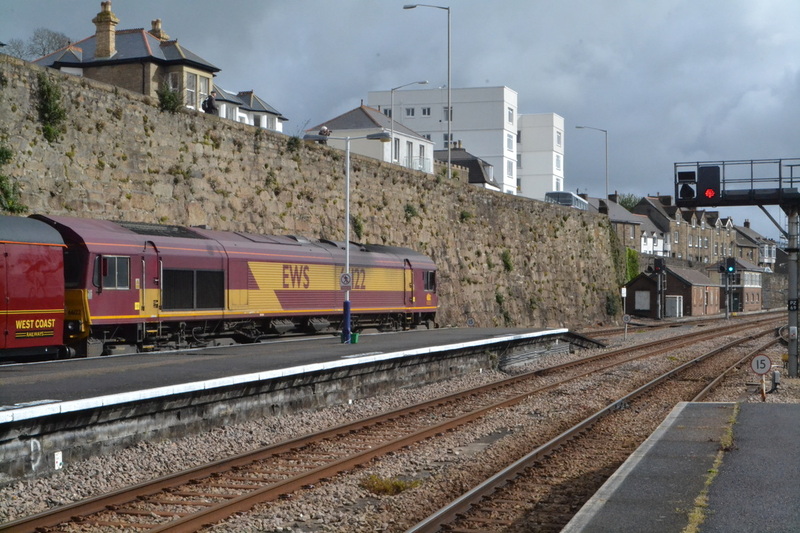 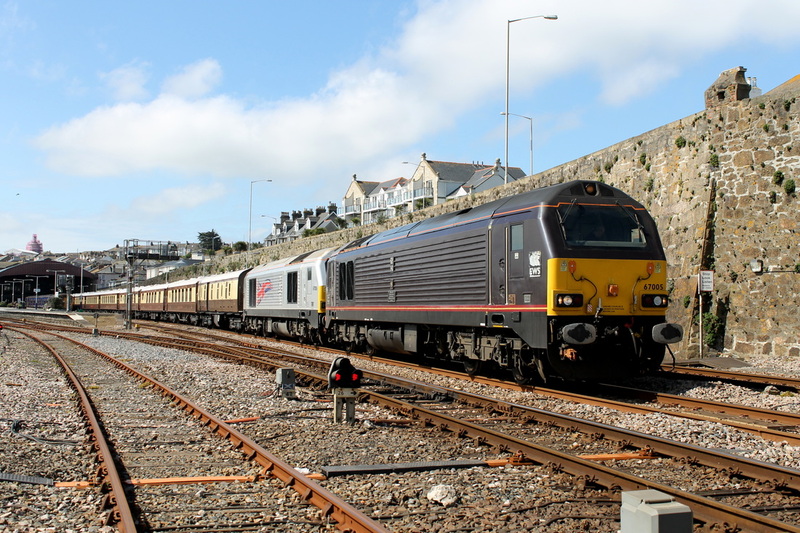 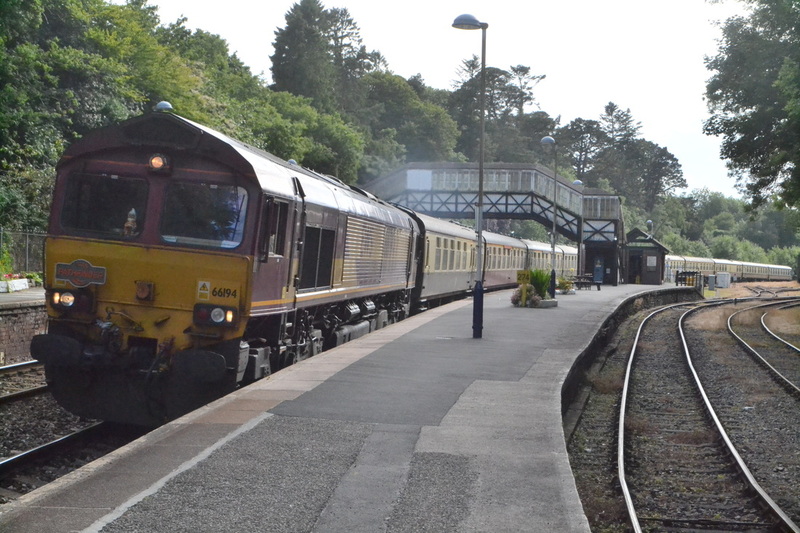 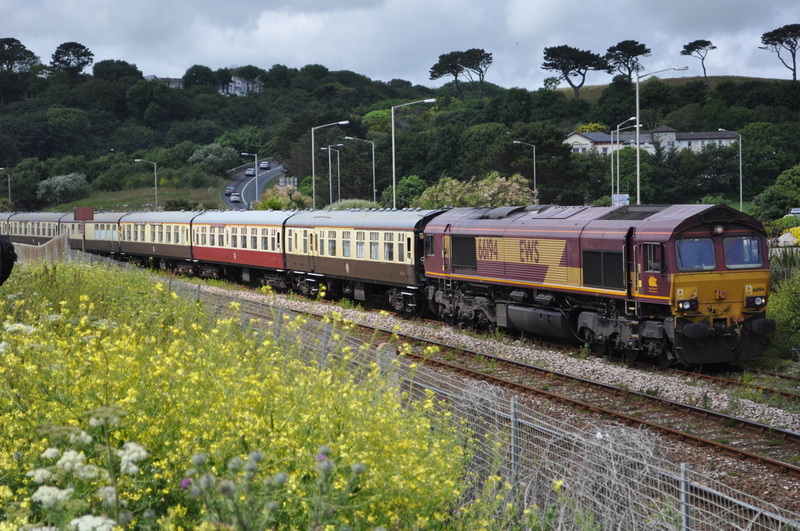 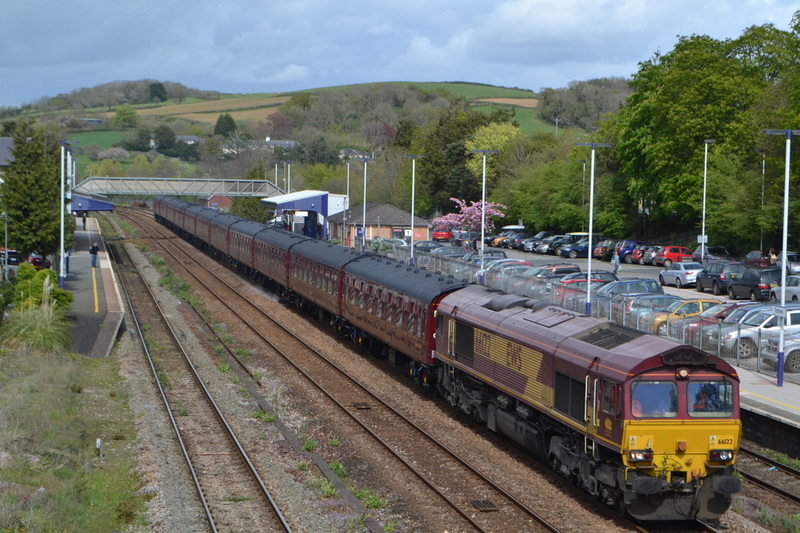 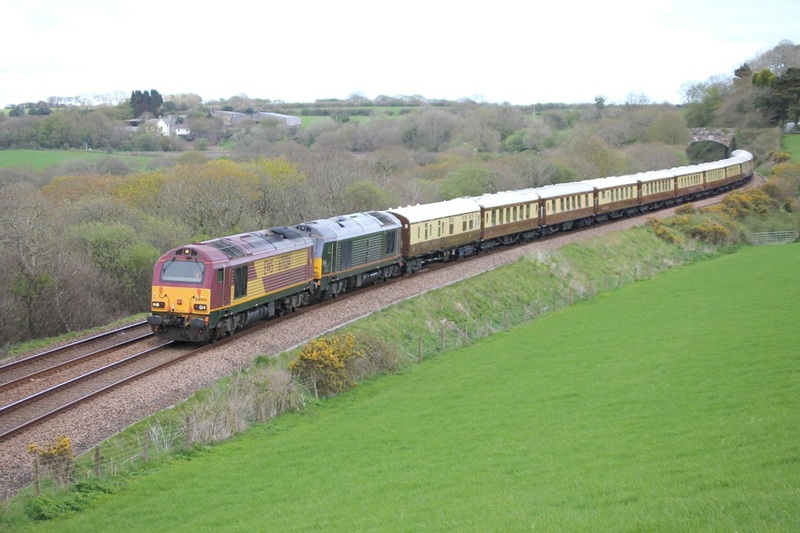 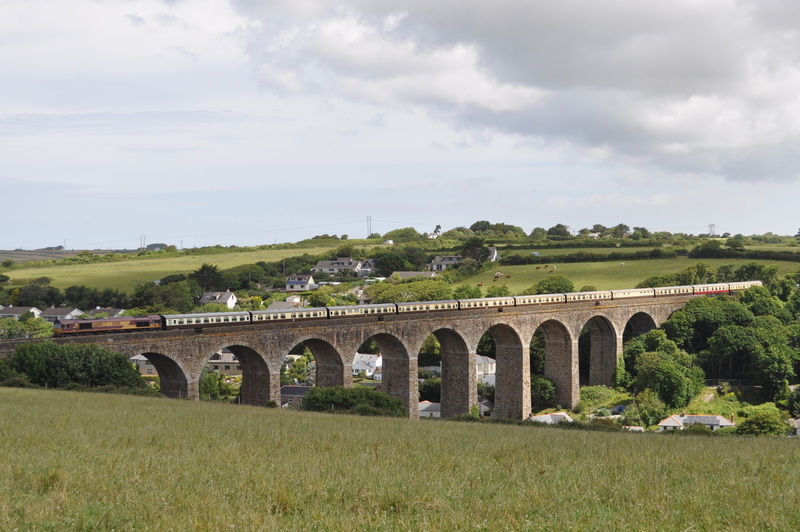 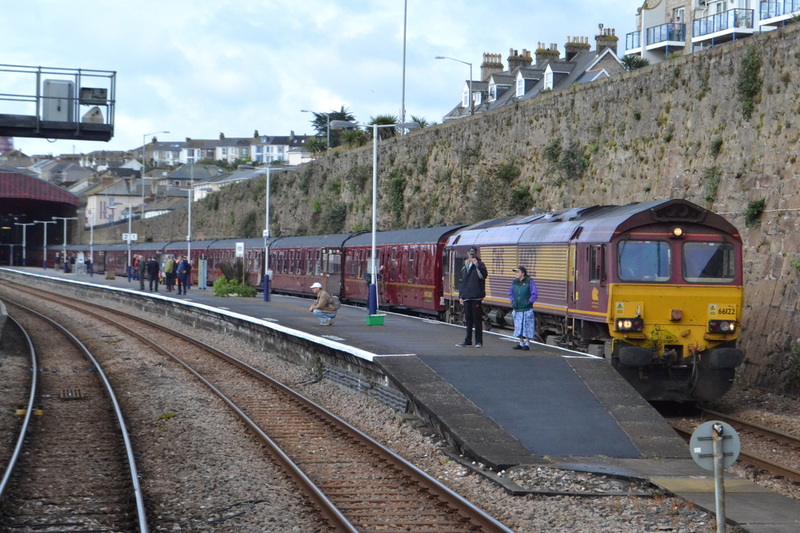 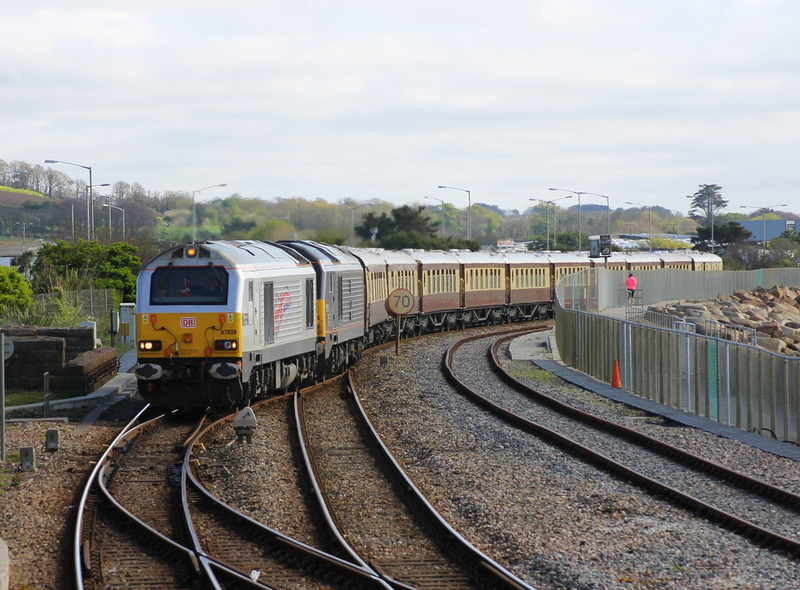 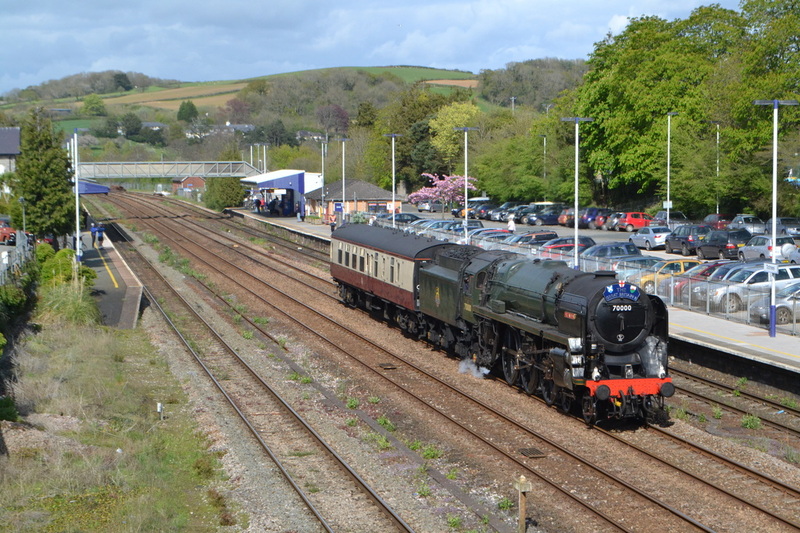 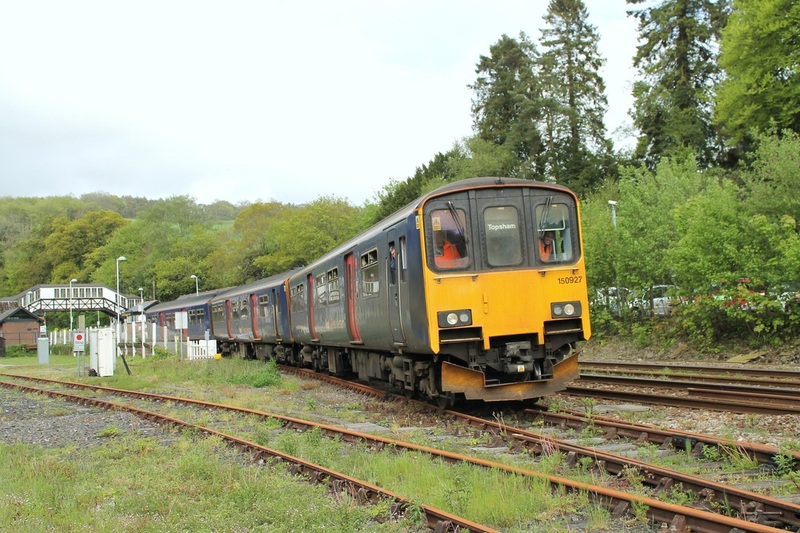 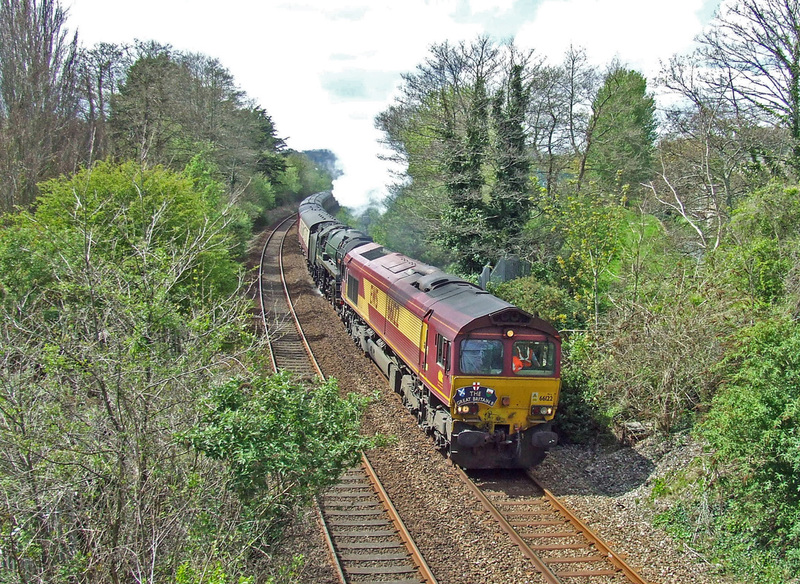 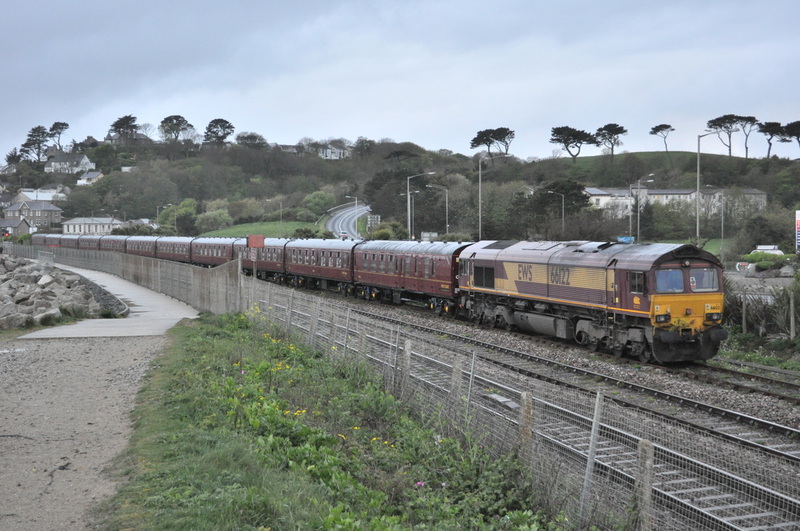 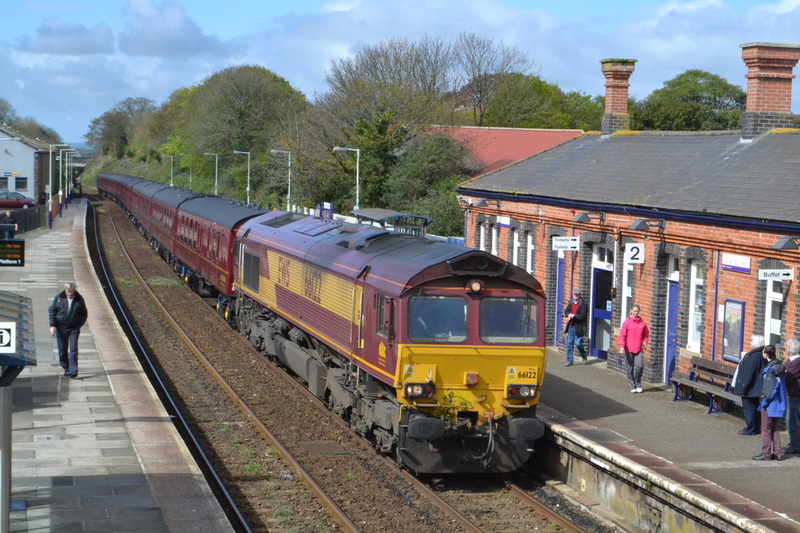 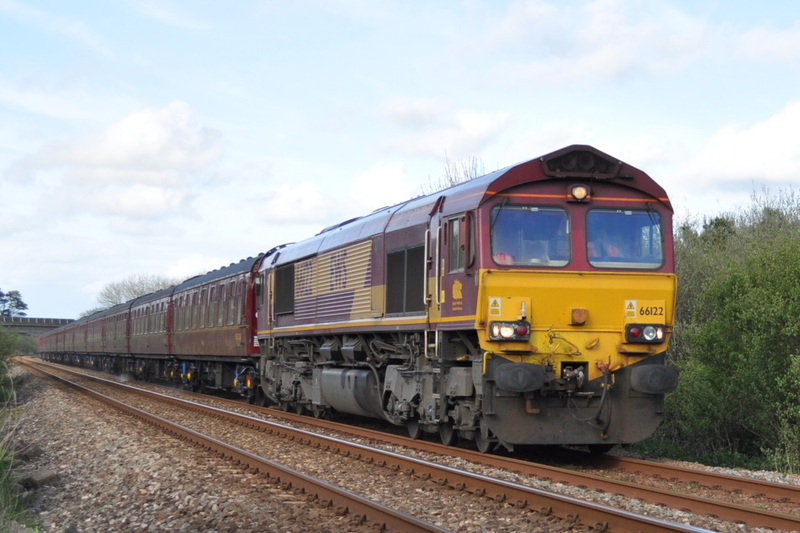 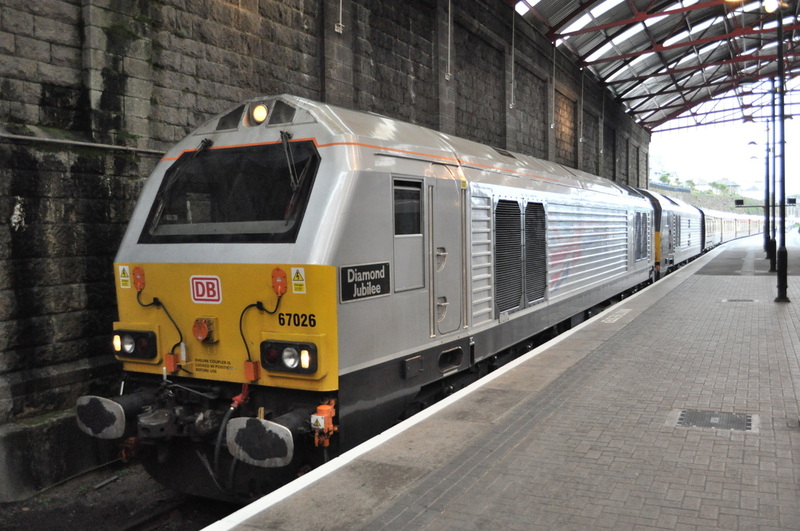 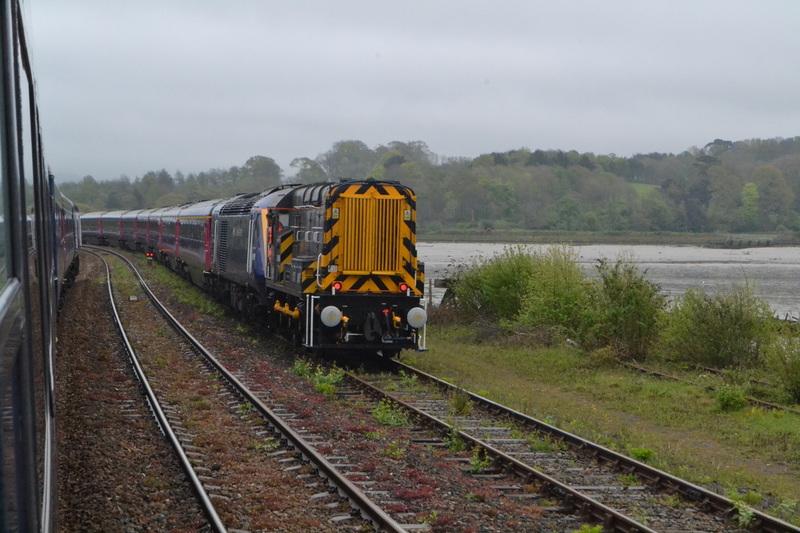 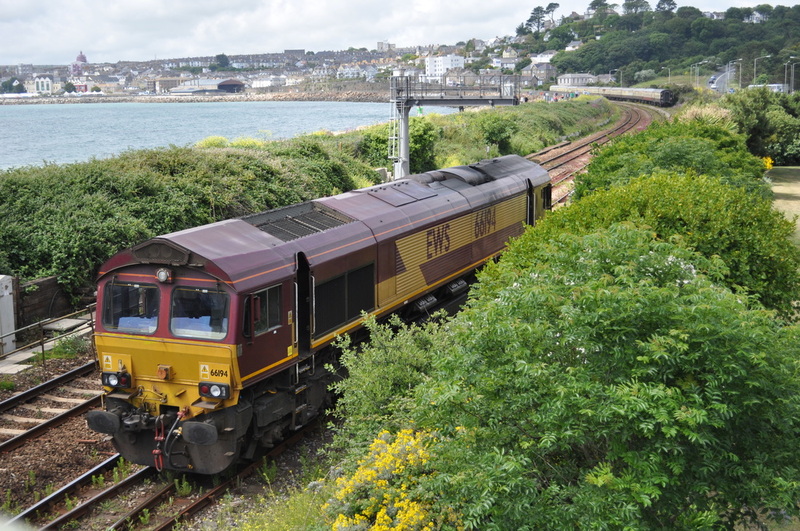 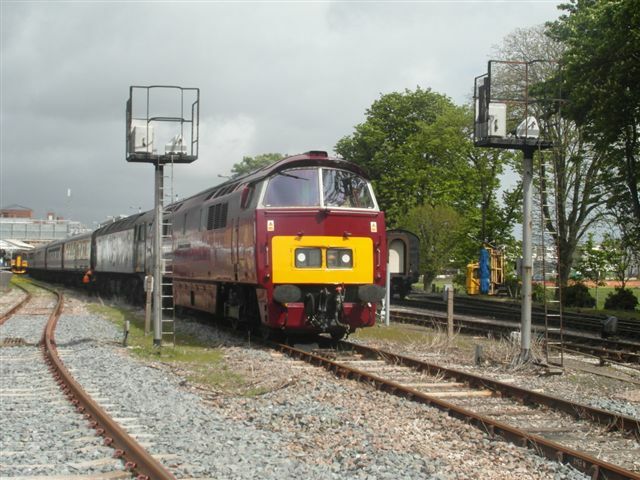 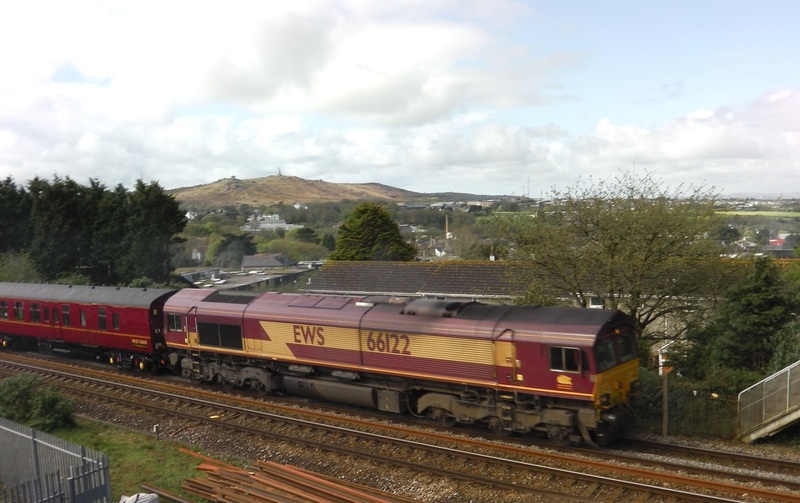 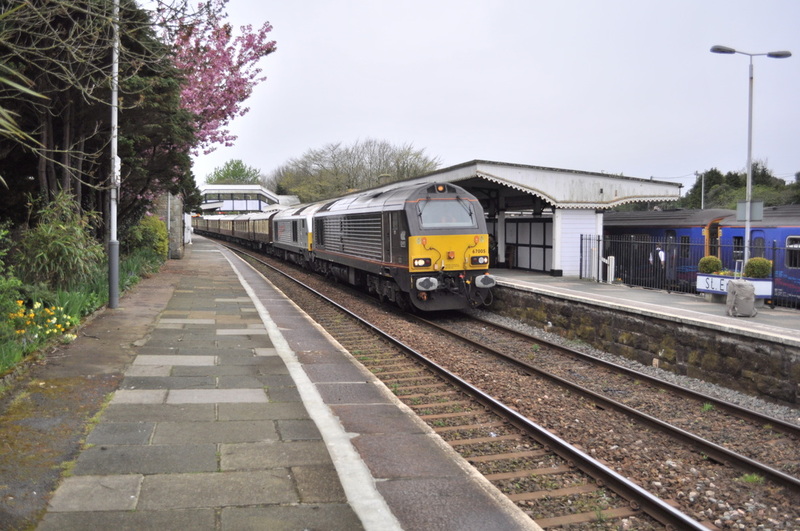 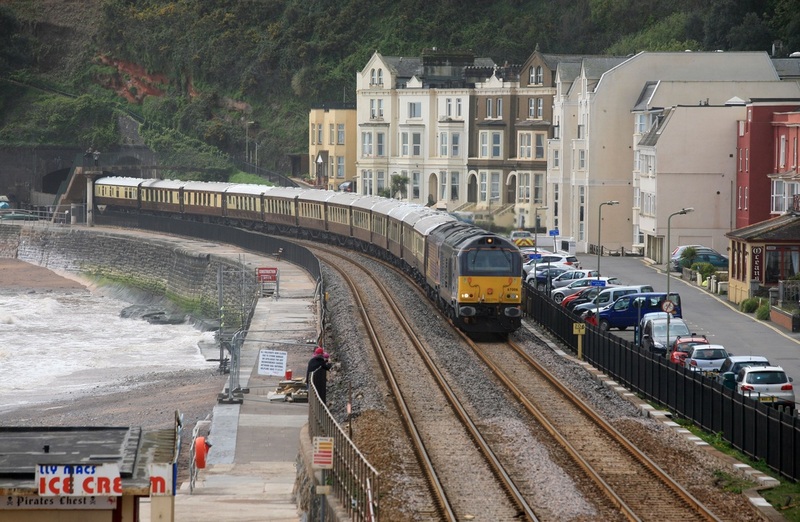 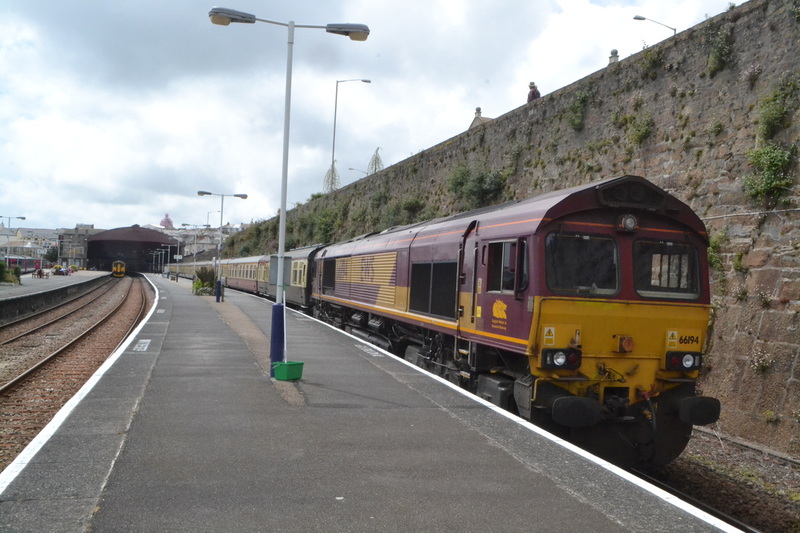 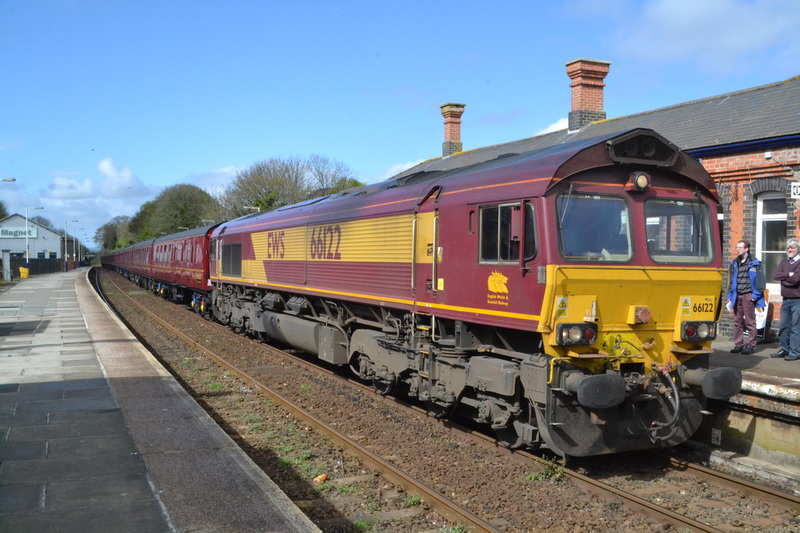 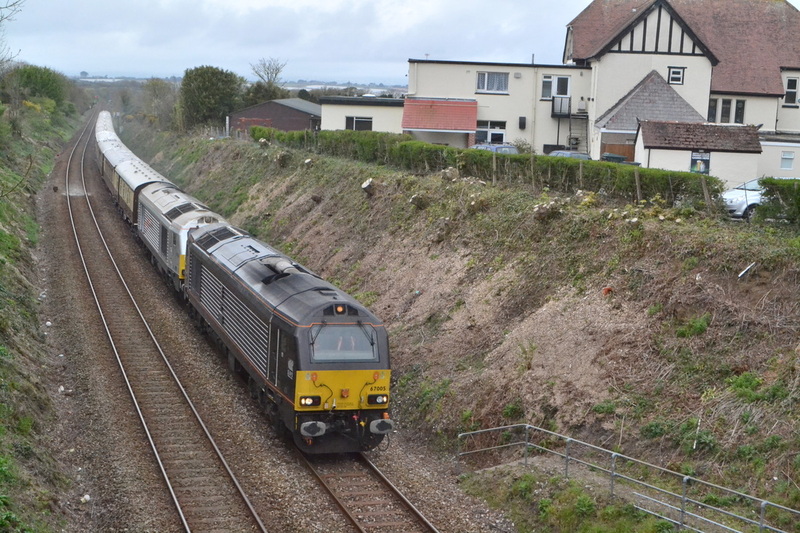 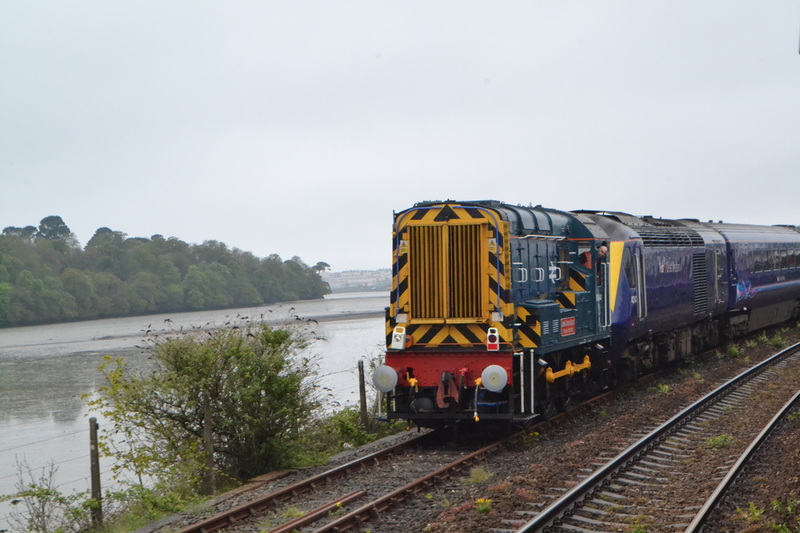 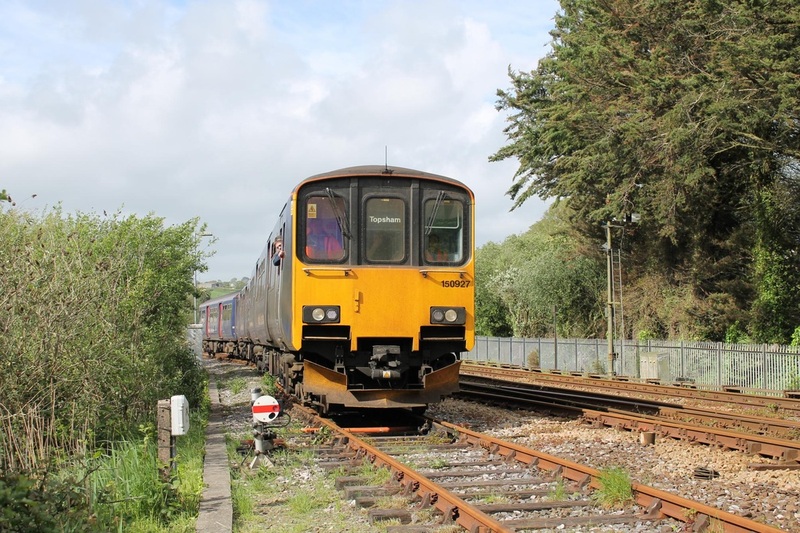 66122 on the Victoria to Penzance Great Britain Railtour at Respryn on Tuesday 28th April 2015 Copyright Roger Geach. 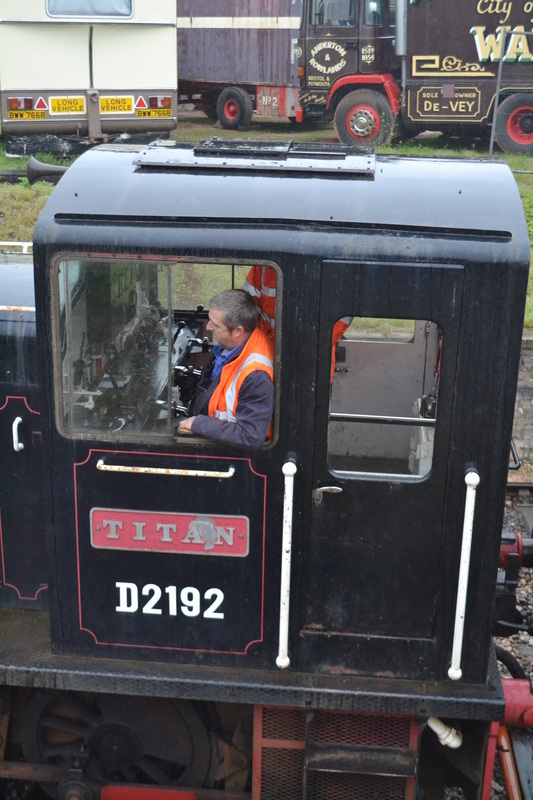 Roger reports that the sun went in 15 mintes earlier! 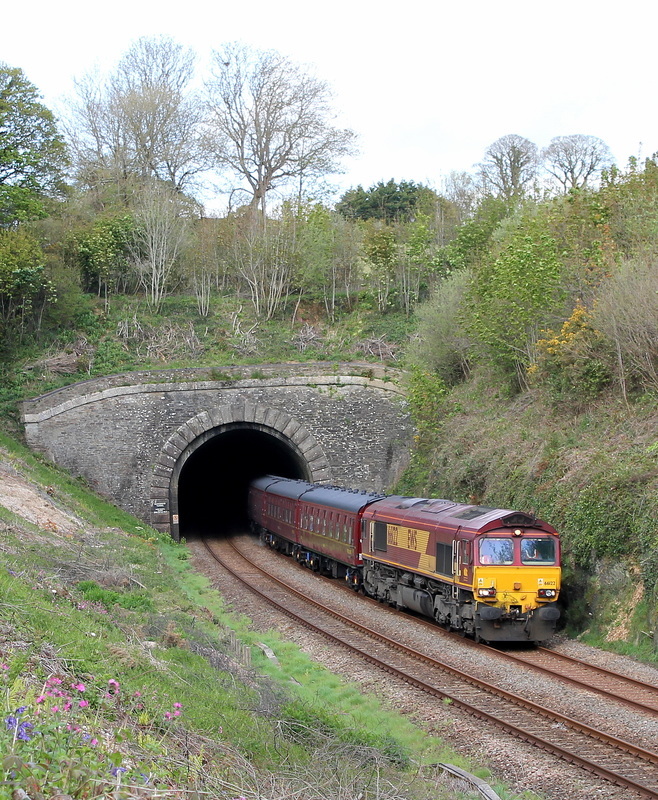 This glorious picture is as 66122 bursts out of Buckshead Tunnel into a cutting decorated with Bluebells and Pink Campion. 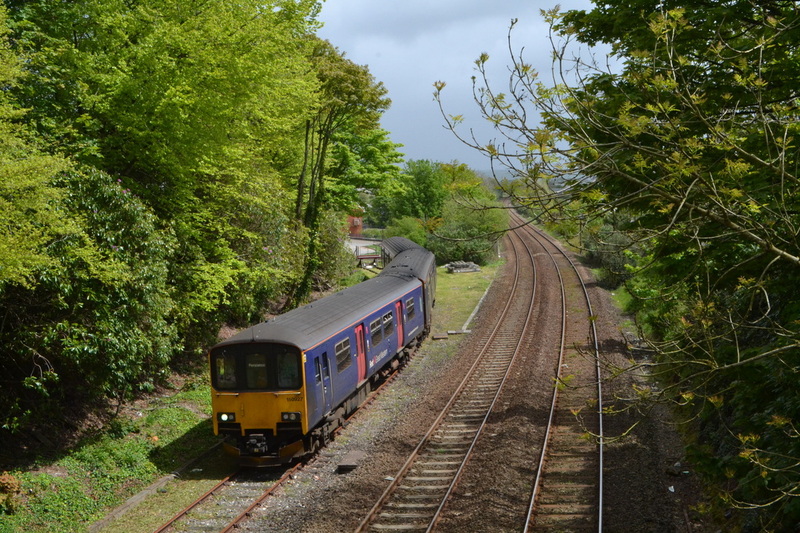 28th April 2015. 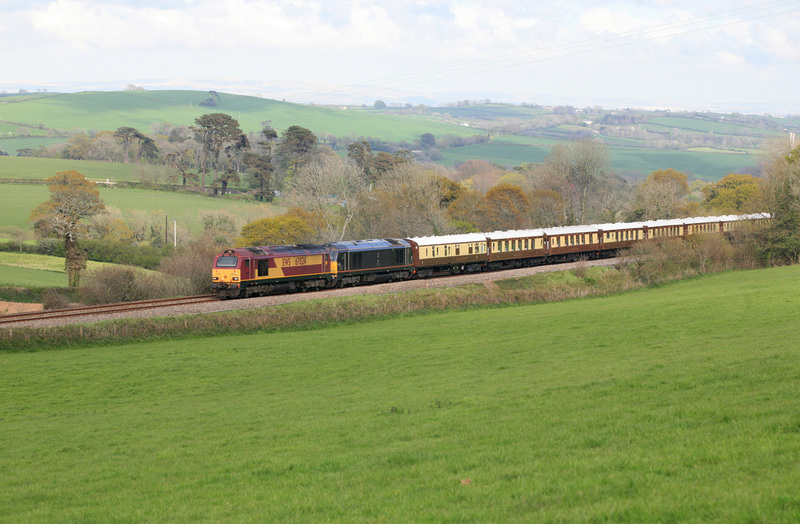 Copyright Craig Munday Note this location is strictly private and accessible only on special permission being gained from the farmer. 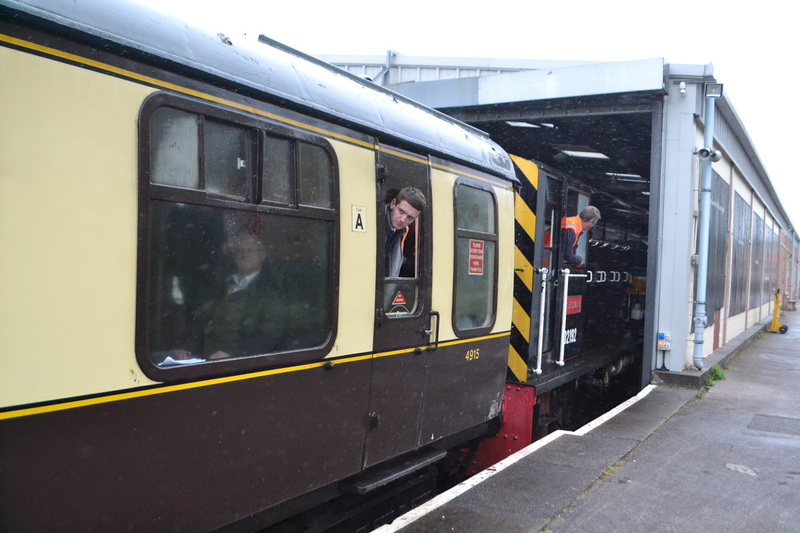 A Cross Country set in platform two forms some interest as the passengers prepare to board GB8 railtour in platform one. 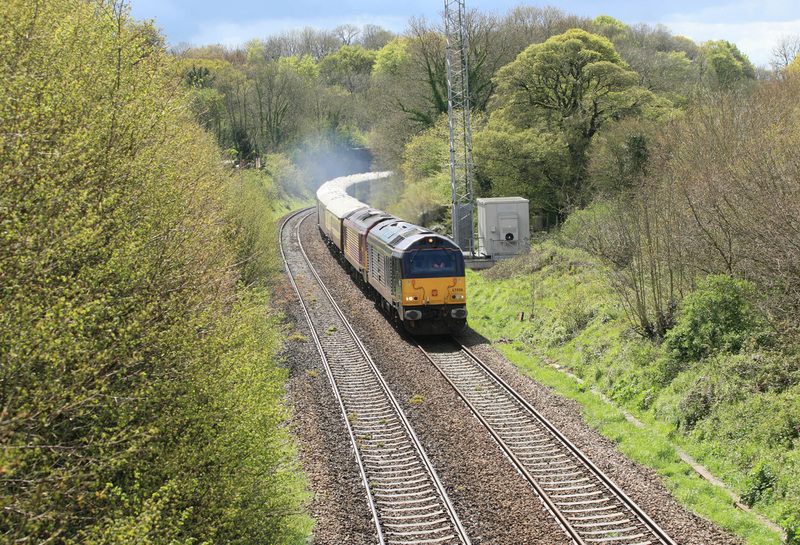 29th April 2015 Copyright Roger Winnen. 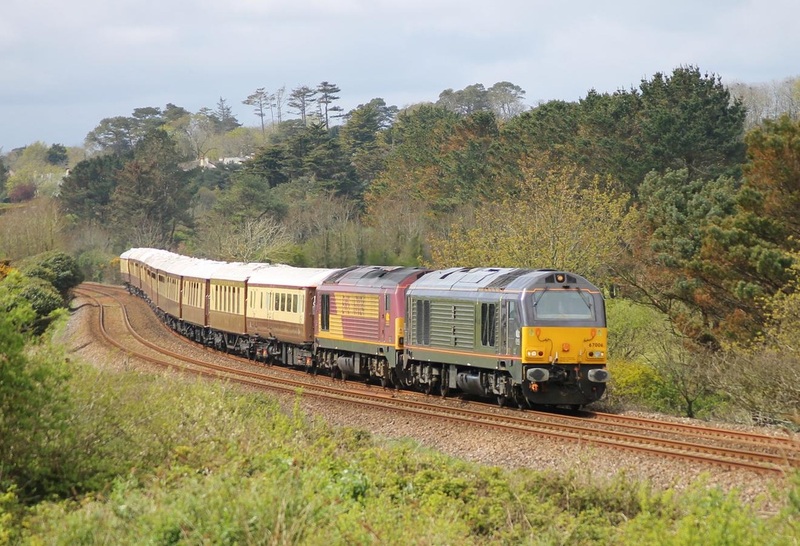 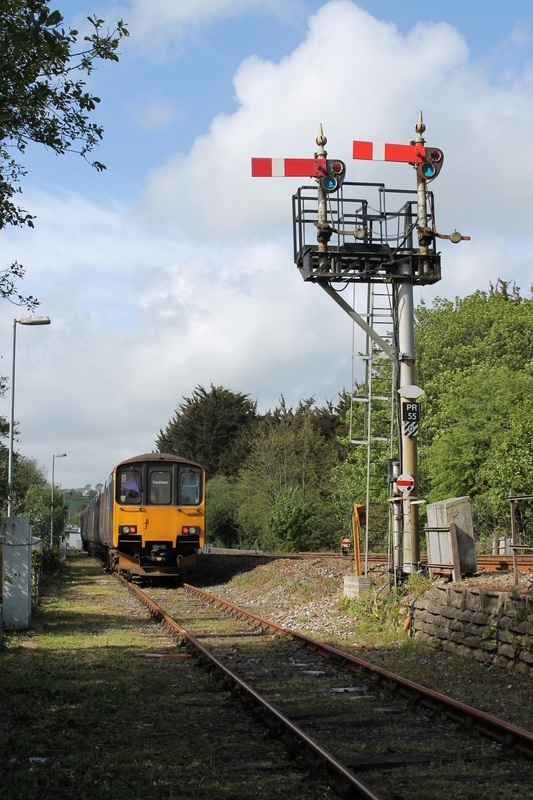 A lovely shot by Trevor Tremethick - some might say spoilt by the lead locomotive, however it is at last carrying the headboard a feature sadly missed on the Cornish Section of the railtour. 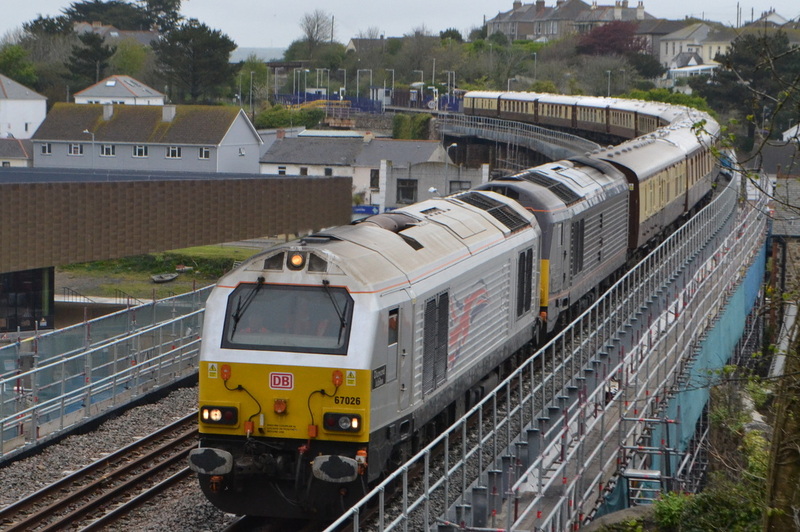 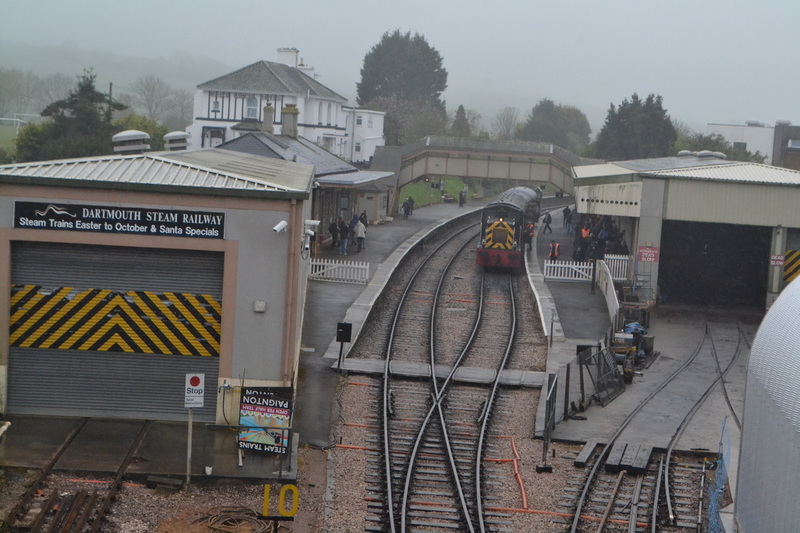 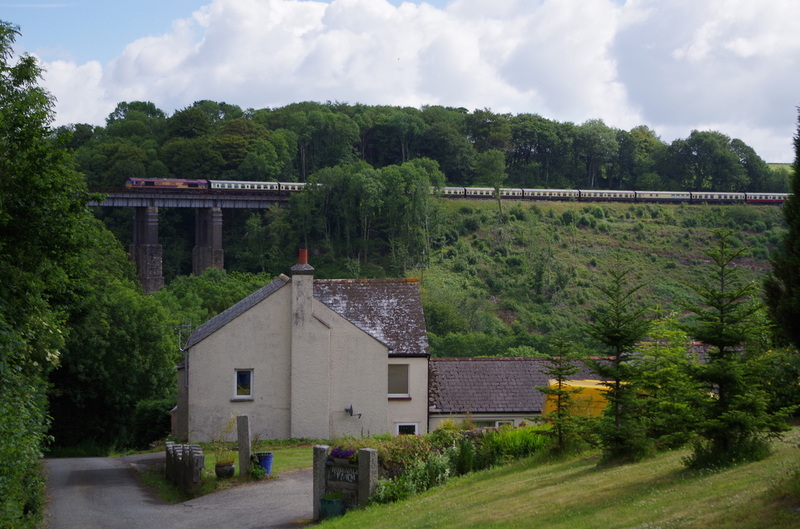 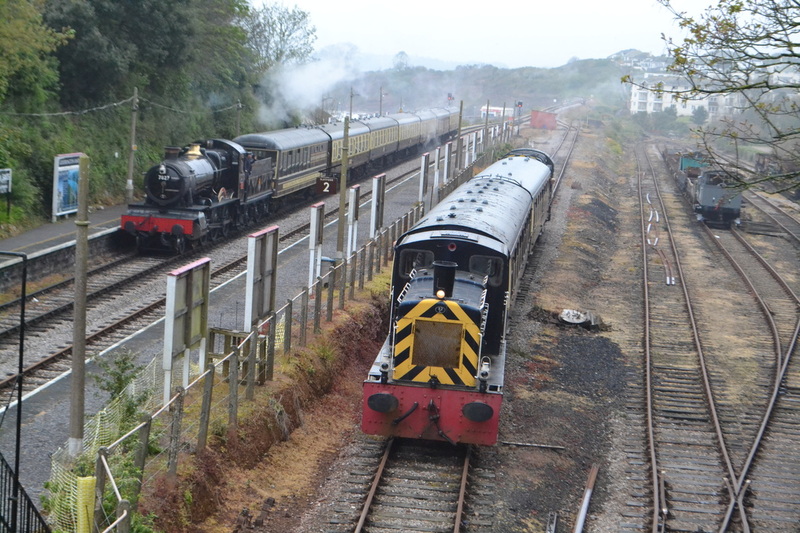 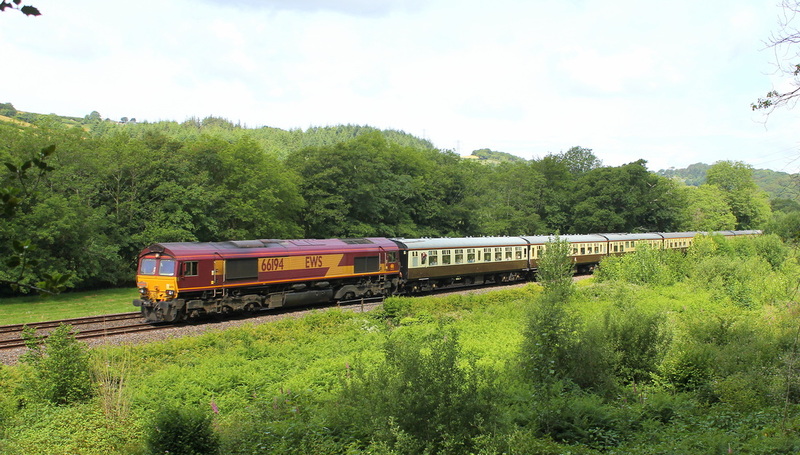 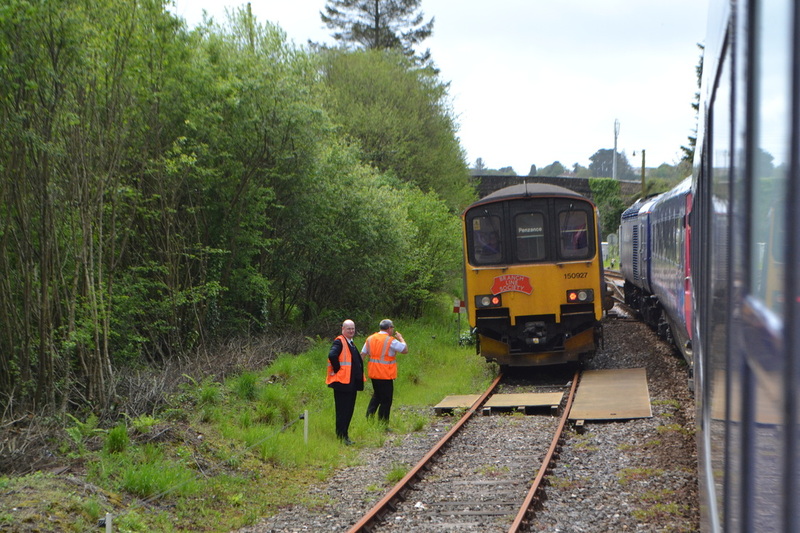 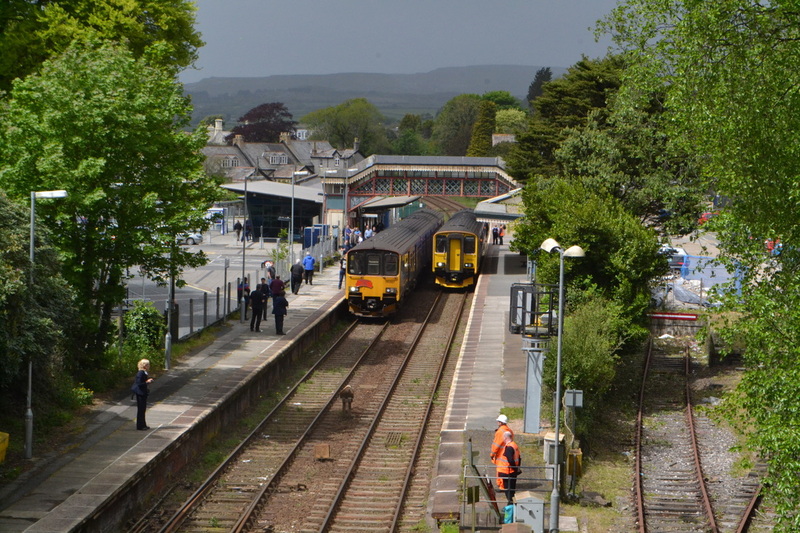 70000 seems to be giving a shove as the train passes under a footbridge between Tavistock Junction and Plympton. 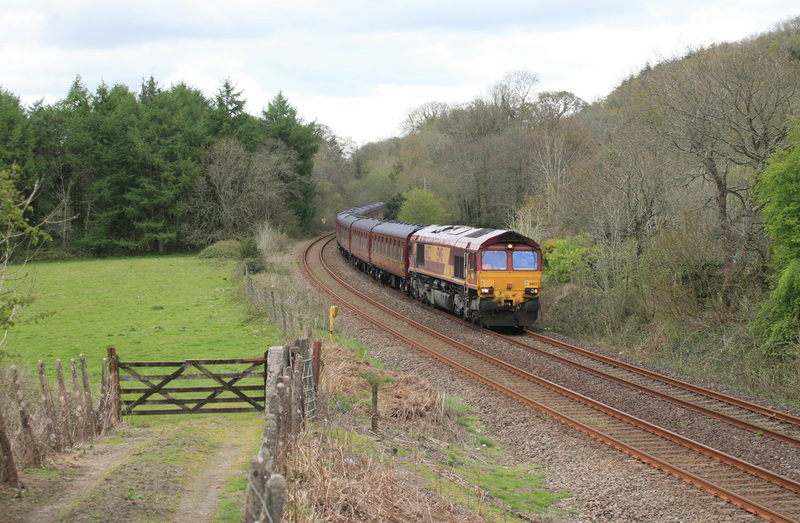 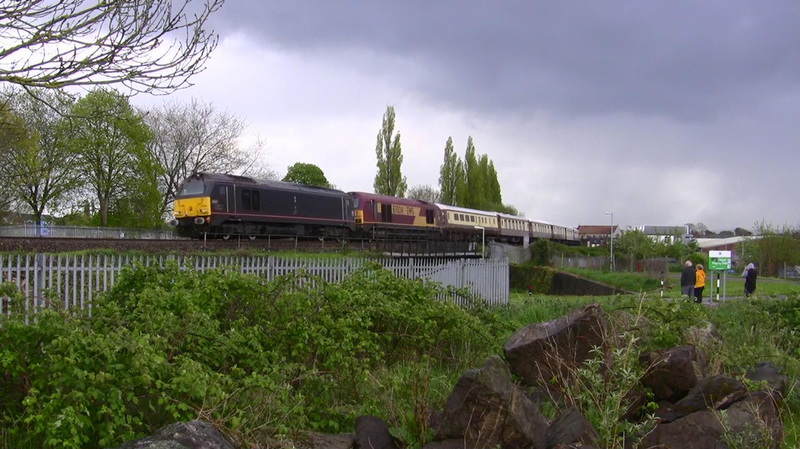 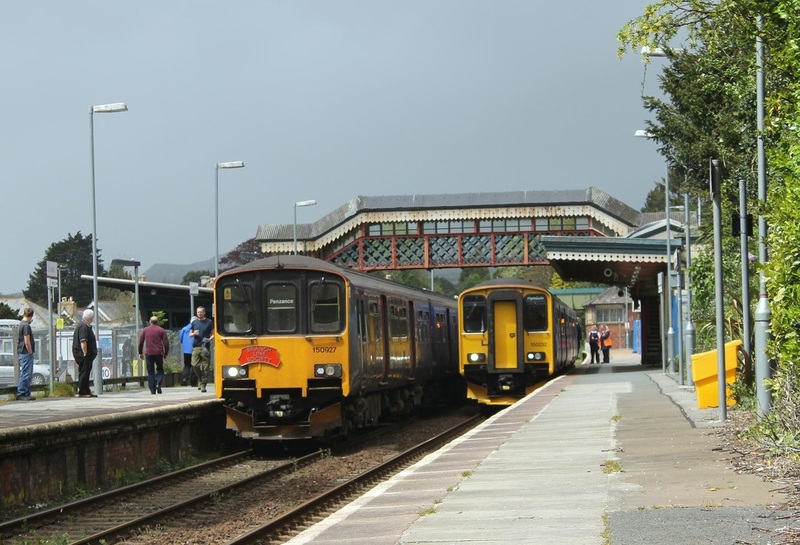 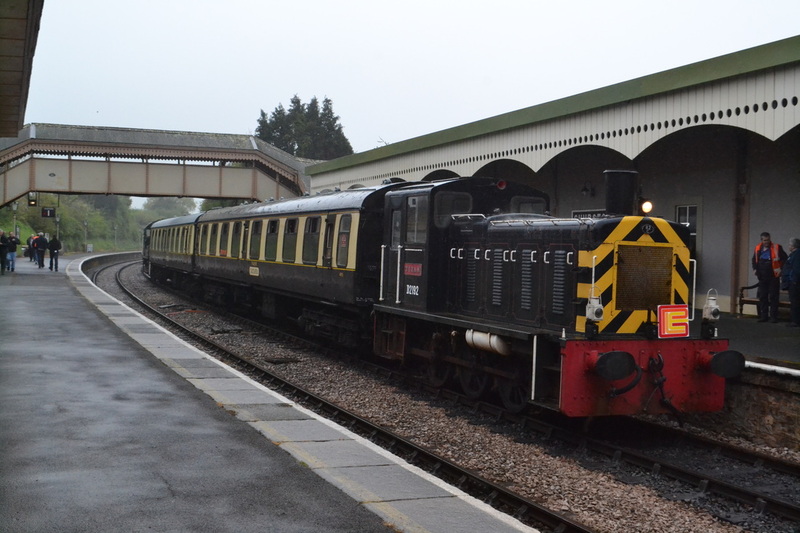 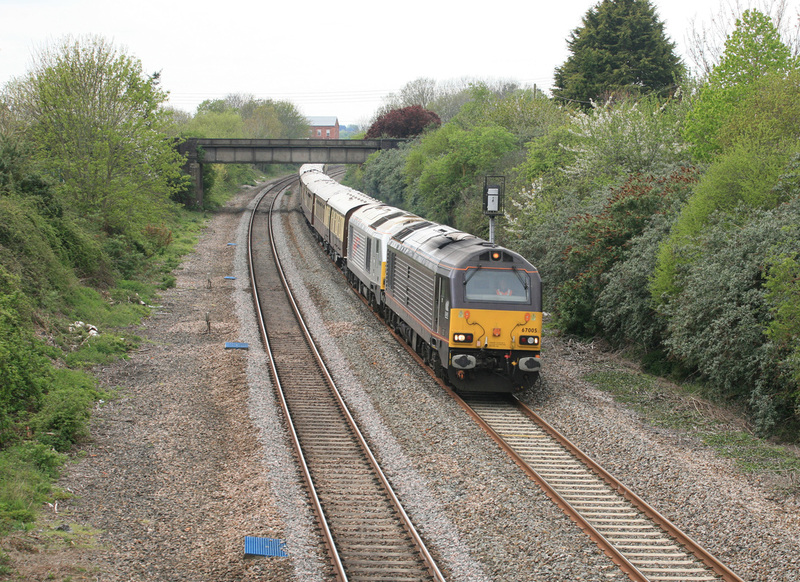 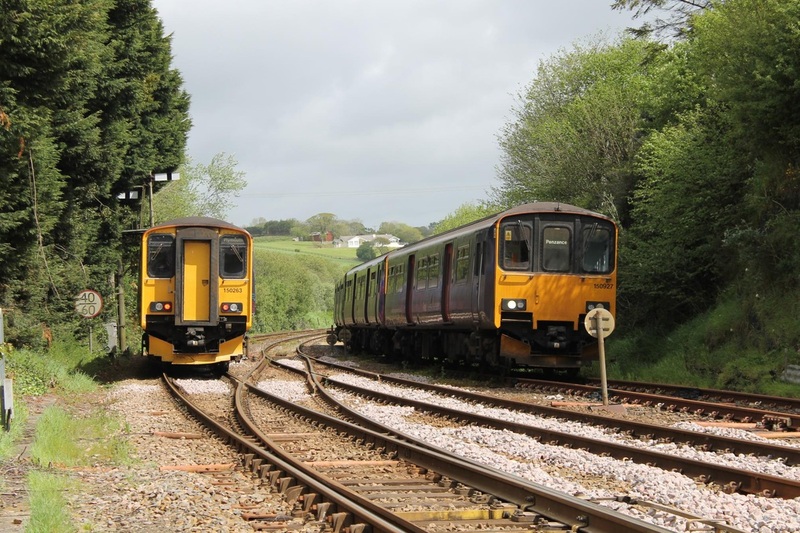 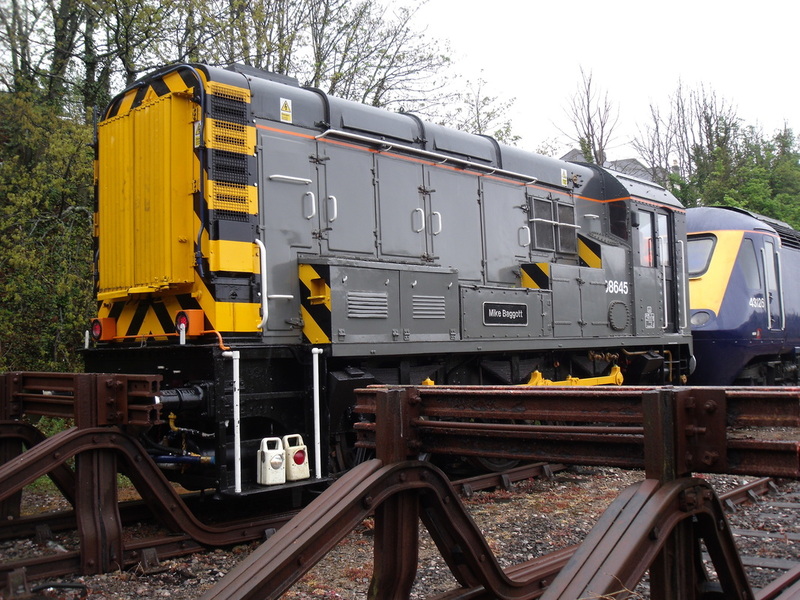 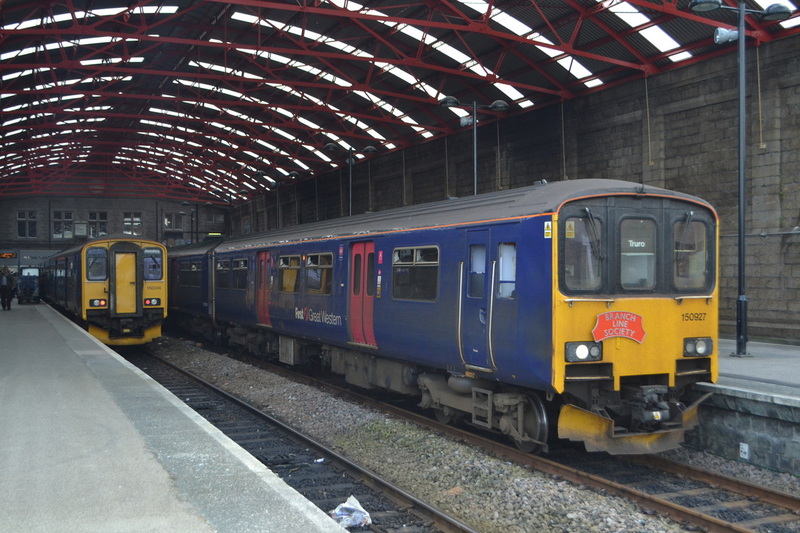 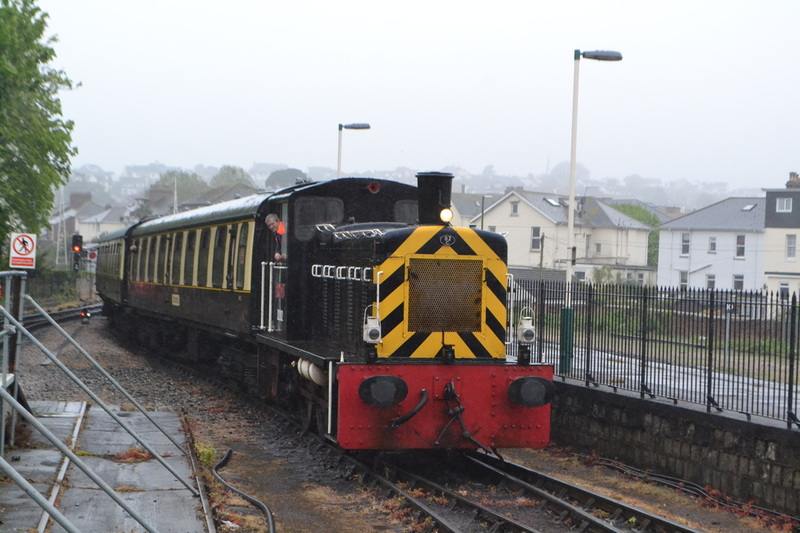 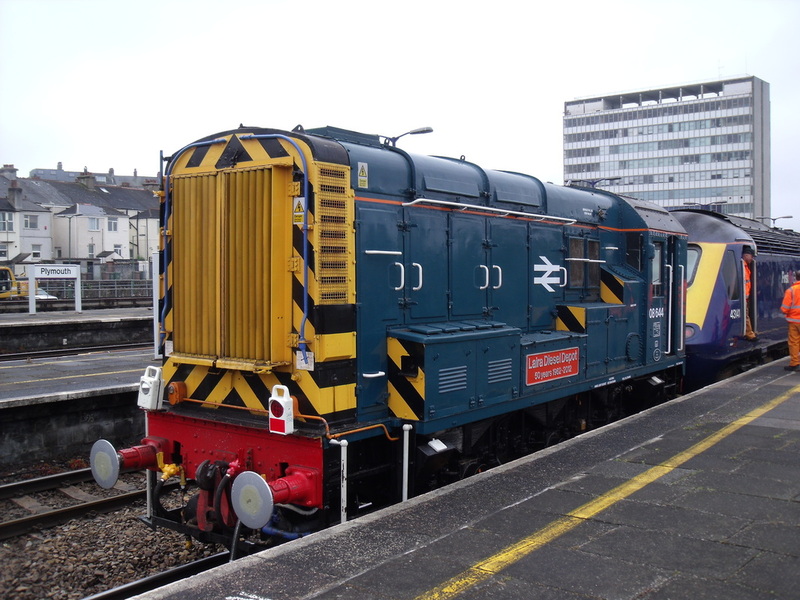 29th April 2015 Copyright Trevor Tremethick. 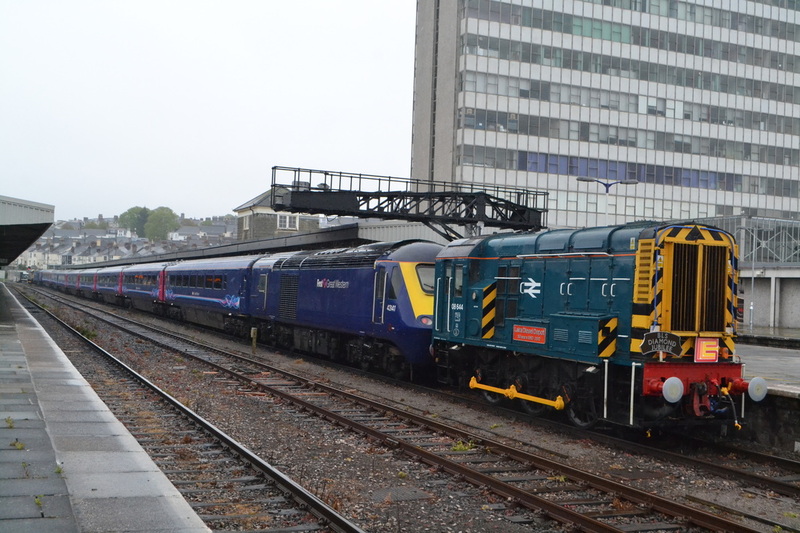 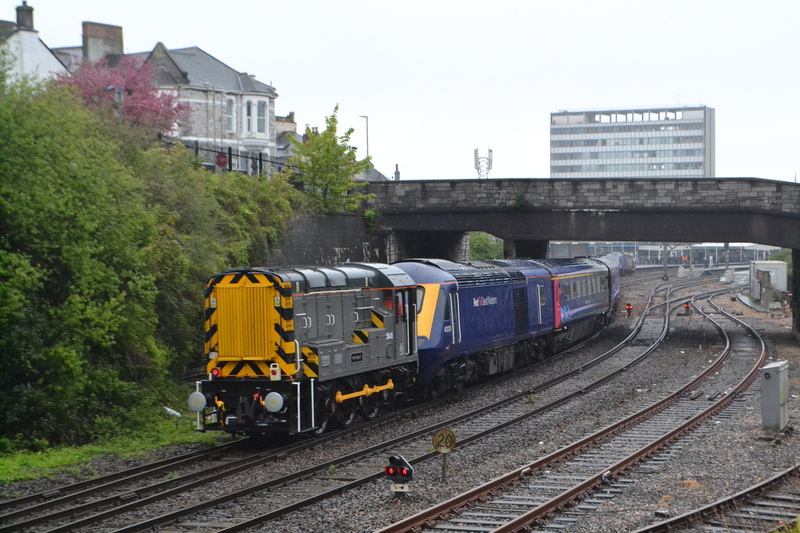 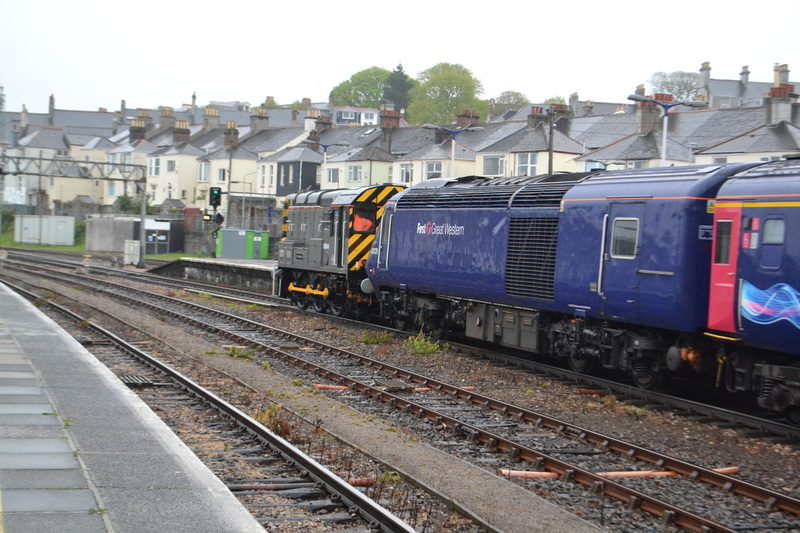 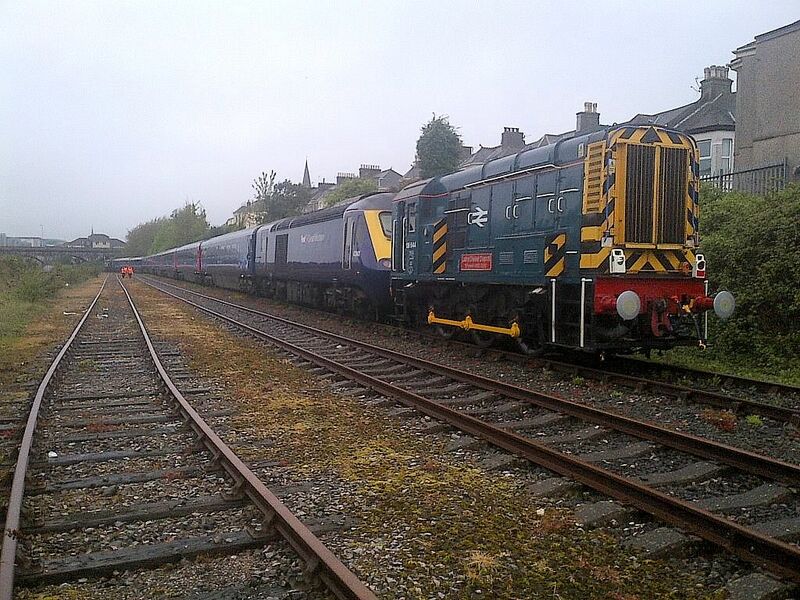 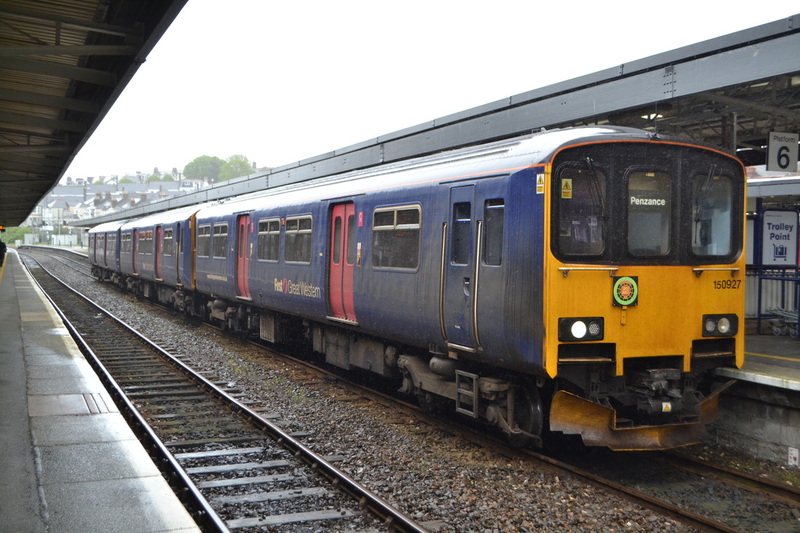 150502e The train departs Plymouth with the 08 plus HST plus an 08 for Laira, she has the green and the RA symbol. 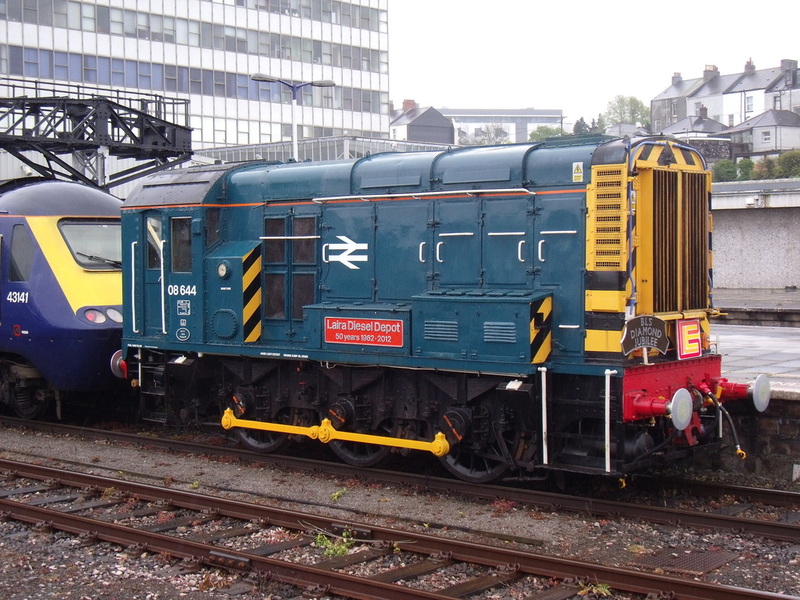 Copyright Roger Winnen. 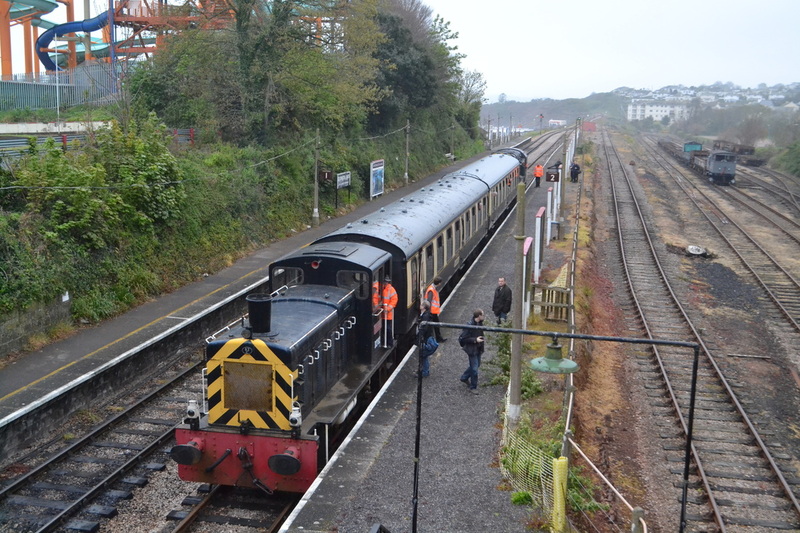 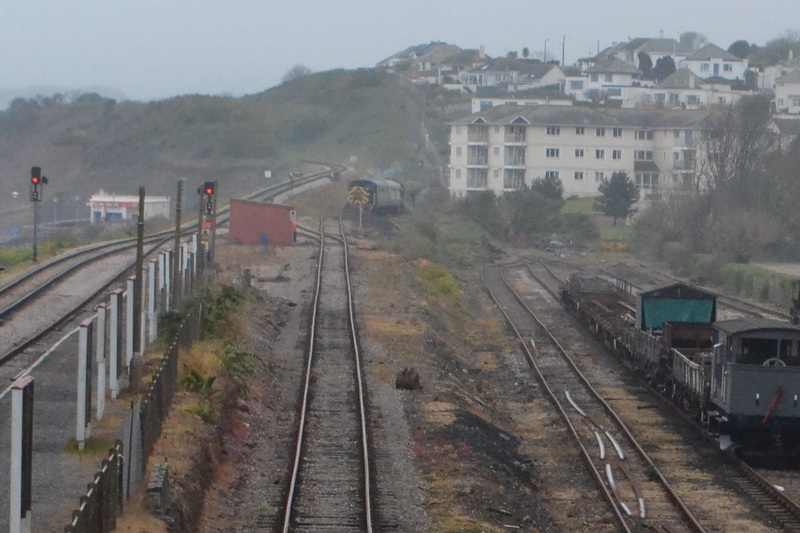 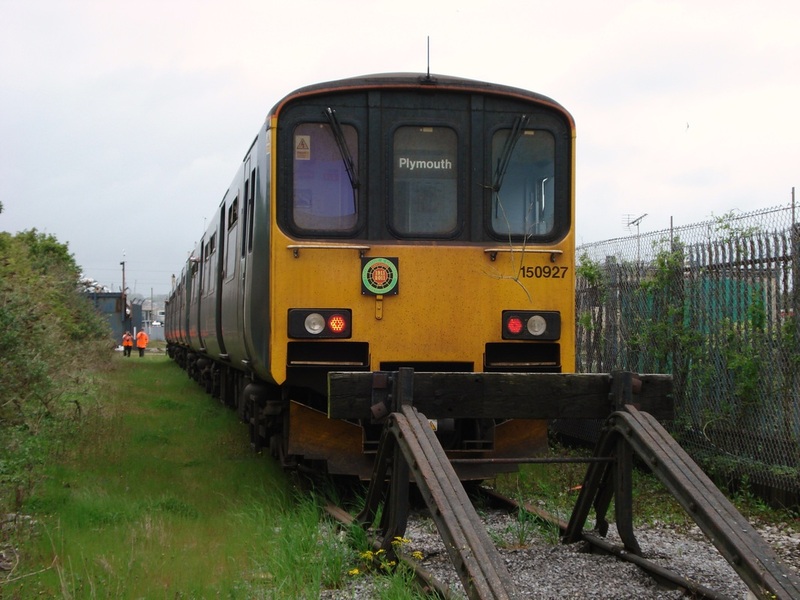 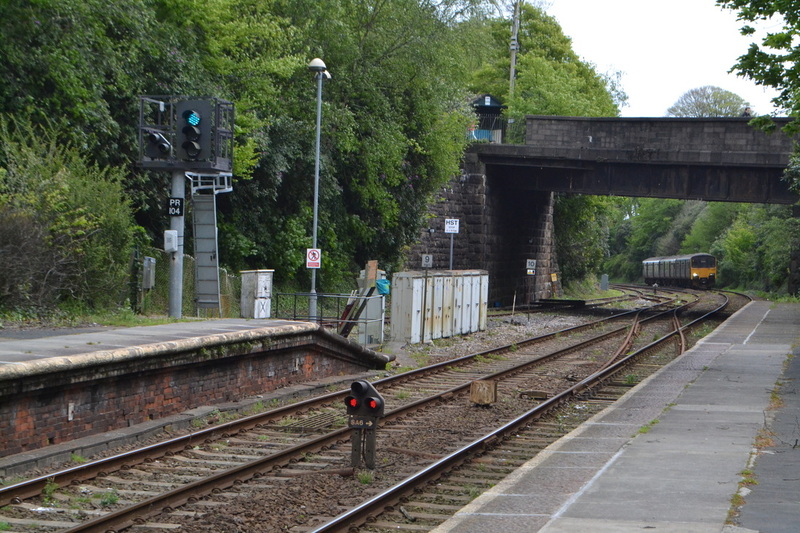 The other end of the train was very nearly into the site of Plymouth Friary, all but about 200 yards. 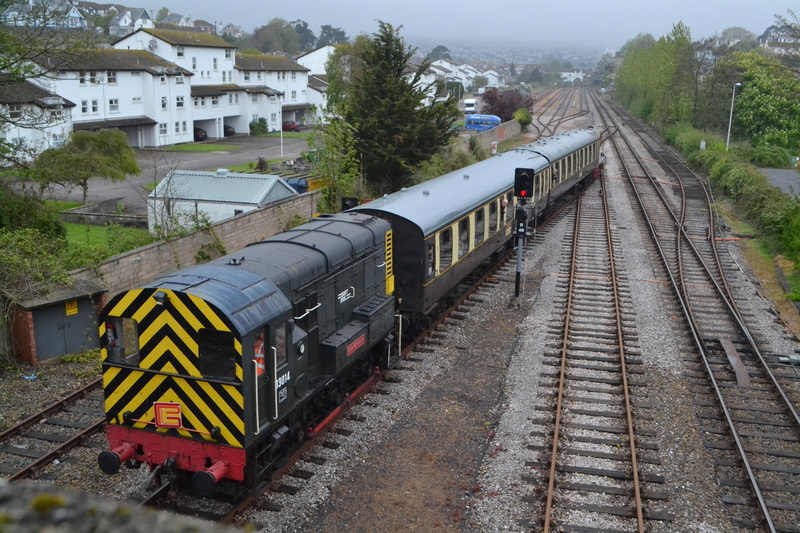 2nd May 2015. 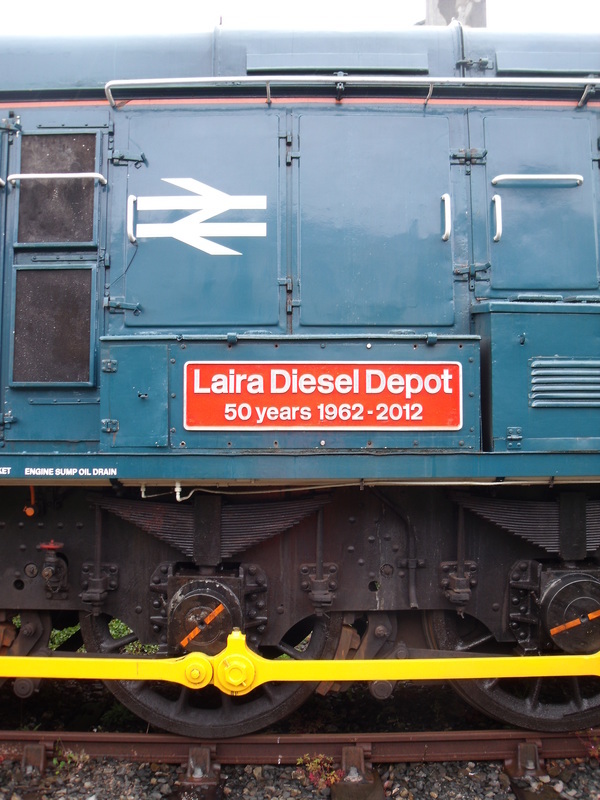 Copyright Martin Duff. 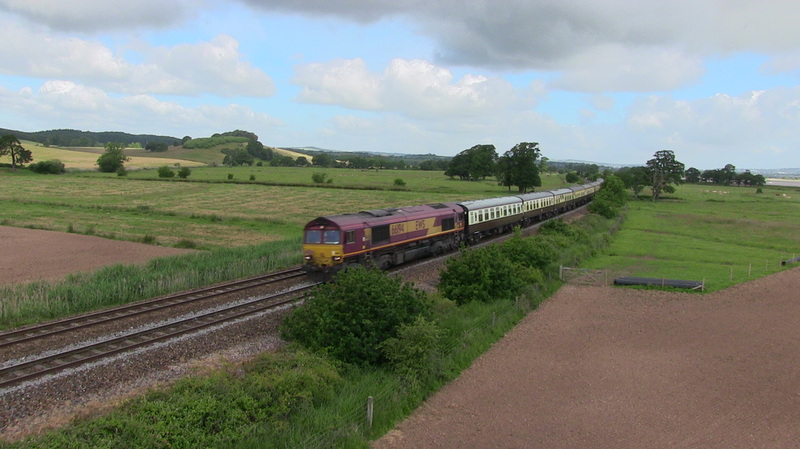 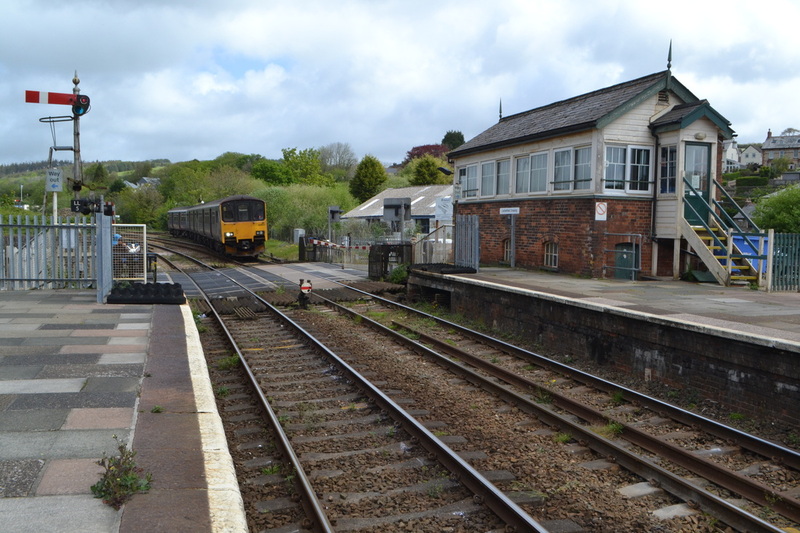 150502s The train now traverses the long siding adjacent to the turntable which once housed the stock for the Saturday 09.45 Churston to Paddington. 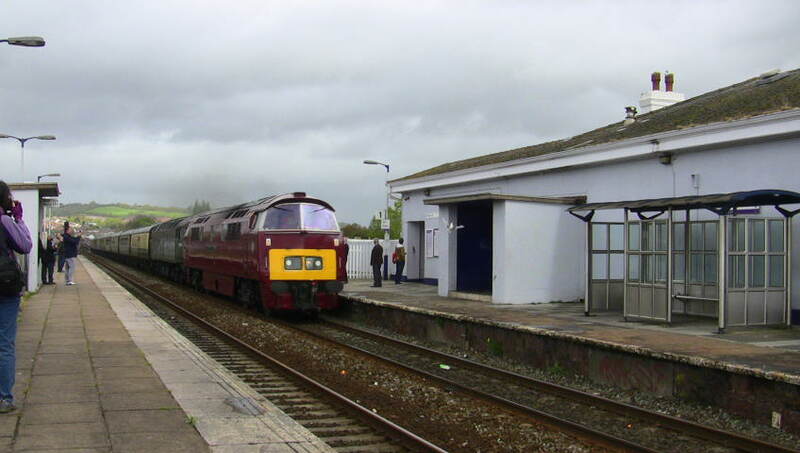 Copyright Roger Winnen. 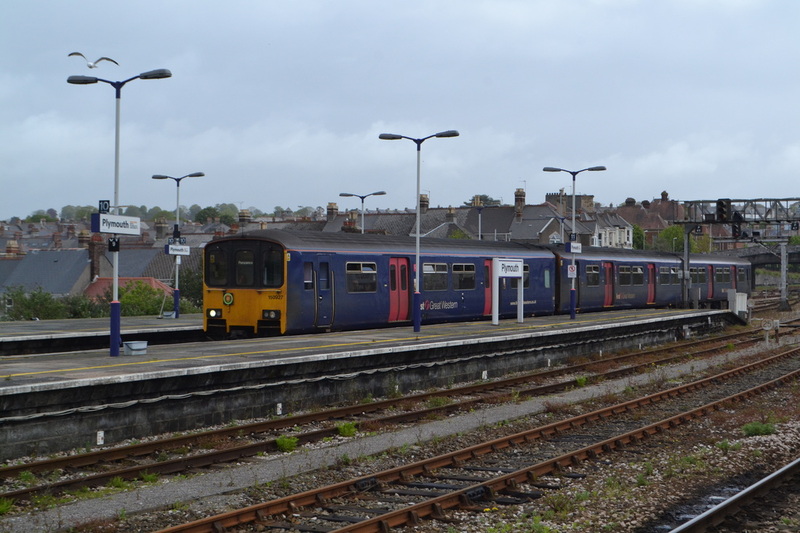 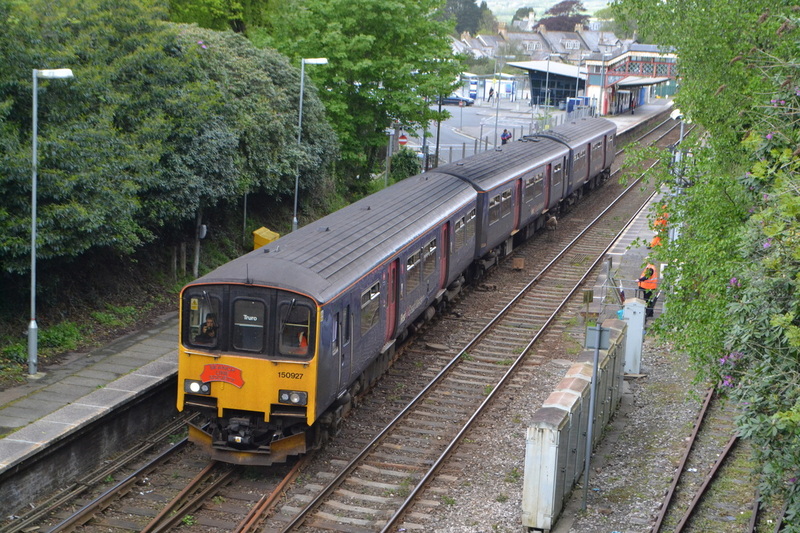 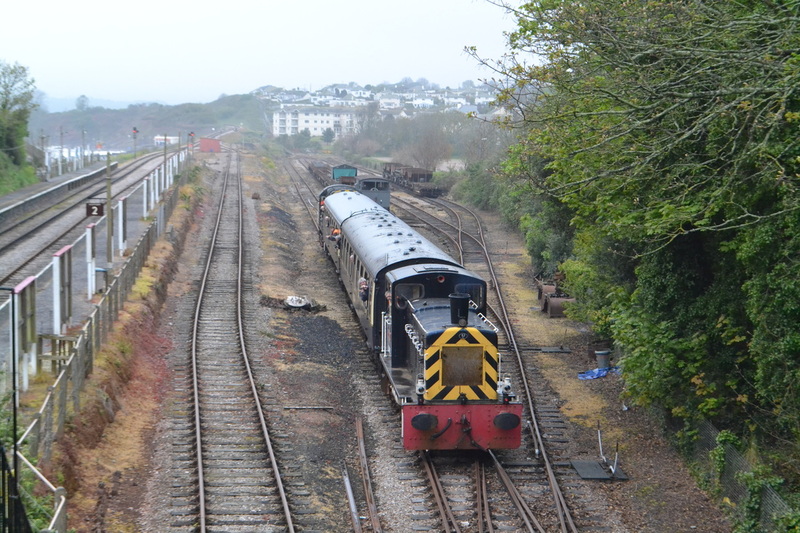 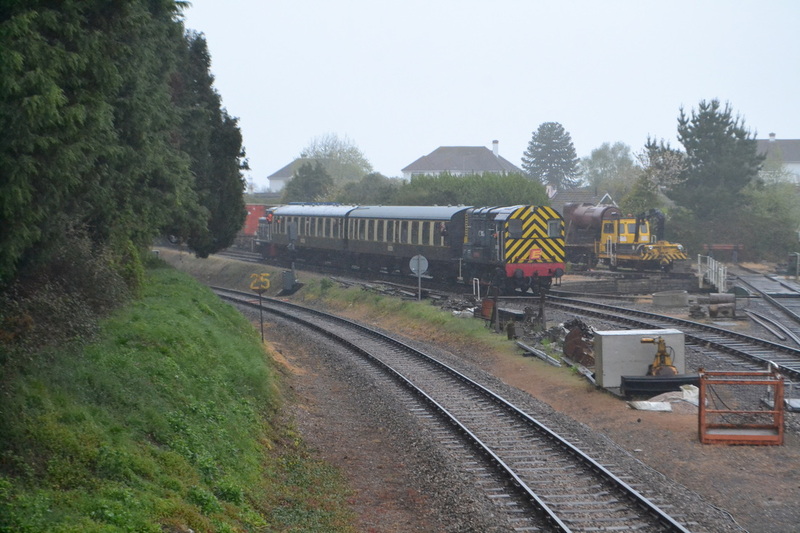 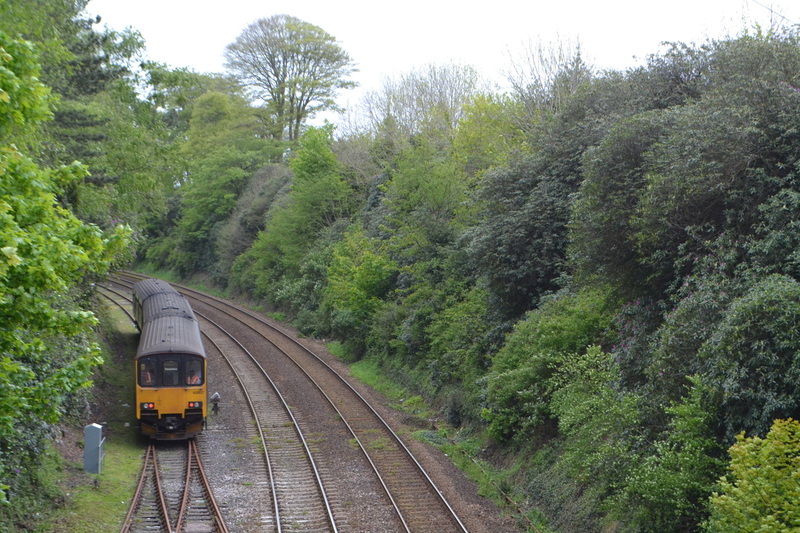 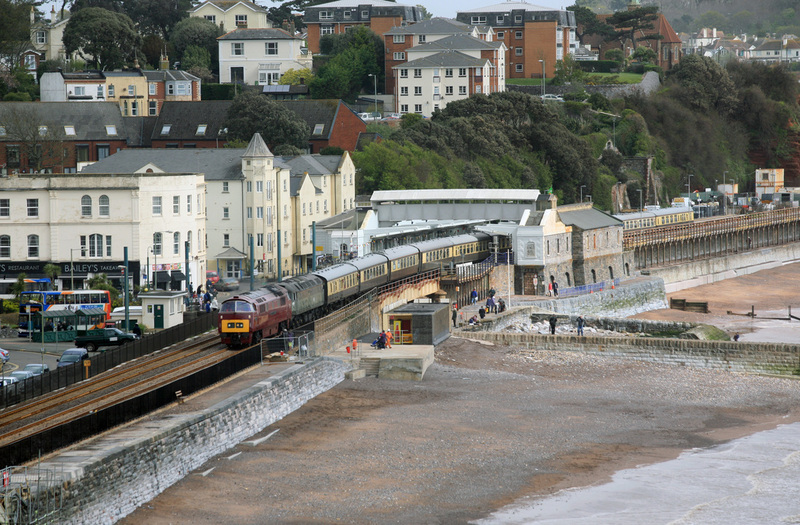 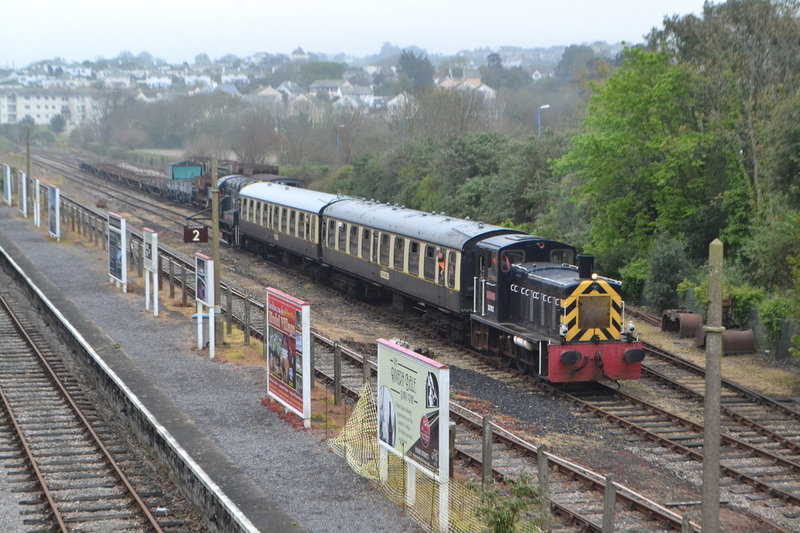 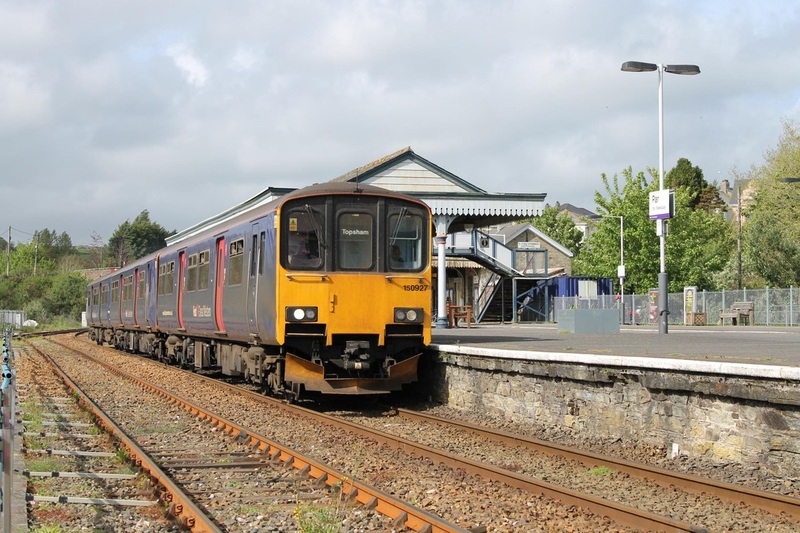 150502s The journey as nearly over as the train enters the engine shed road at Paignton Queens Park Station. 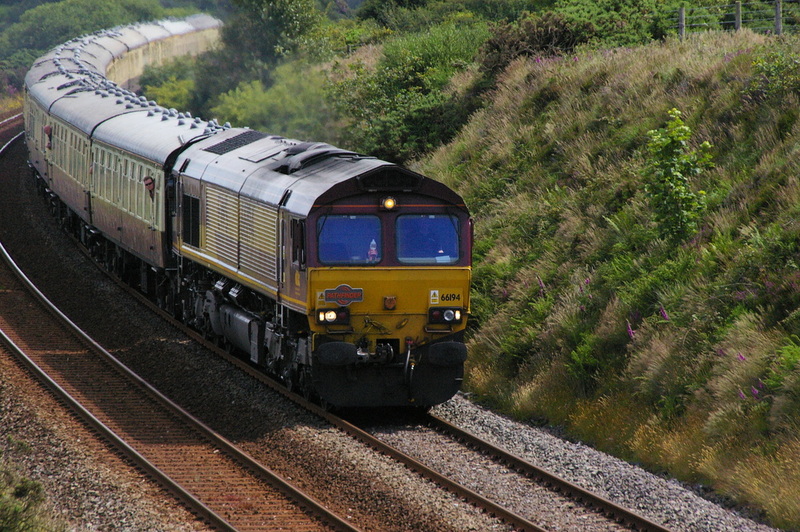 Copyright Roger Winnen. 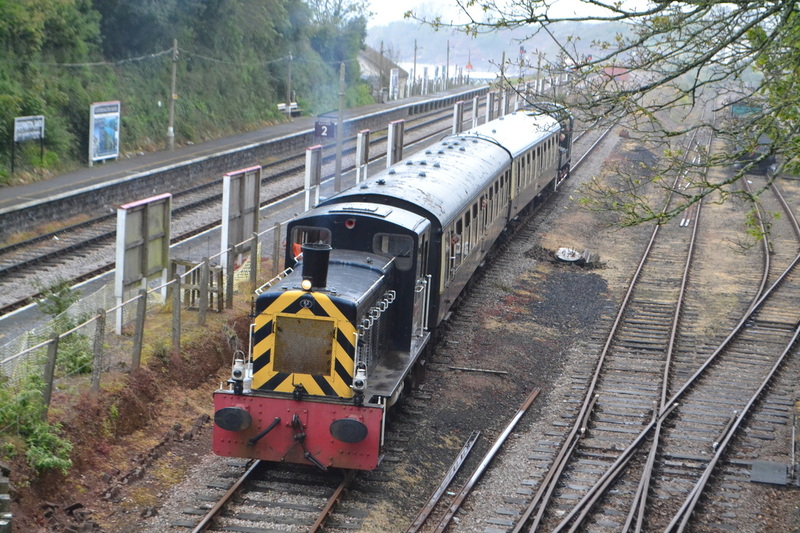 191F from Tame Parkway (dep. 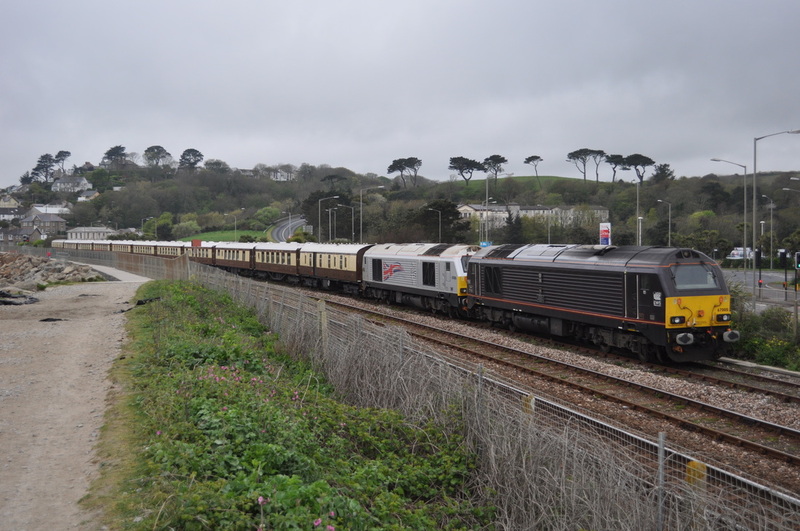 04.45) to Penzance for Mazey Day.